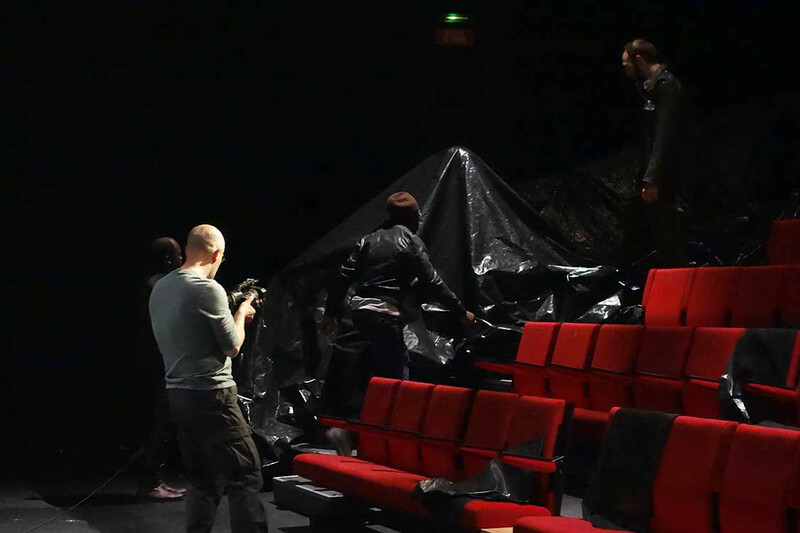 Conception & direction Catherine Boskowitz // Dramaturgie Leila Rabih // Assistant Estel Lesage // Scenography Jc Lanquetin //Objects and Construction Yoris Van Den Houte// Lights & video Laurent Vergnaud // Sound creation Benoit Bouvot // With Nadège Prugnard, Nanténé Traoré, Fatima Tchiombiano, Marcel Mankita, Lamine Diarra, Simon Mauclair, Adèll Nodé Langlois // Creation in Choisy Le Roy Scène Nationale, march 6 2015 – and then Collectif 12 Mantes la Jolie & Théâtre des Quartiers d’Ivry, march and may 2015. 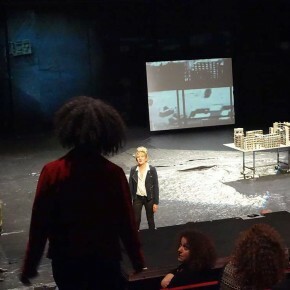 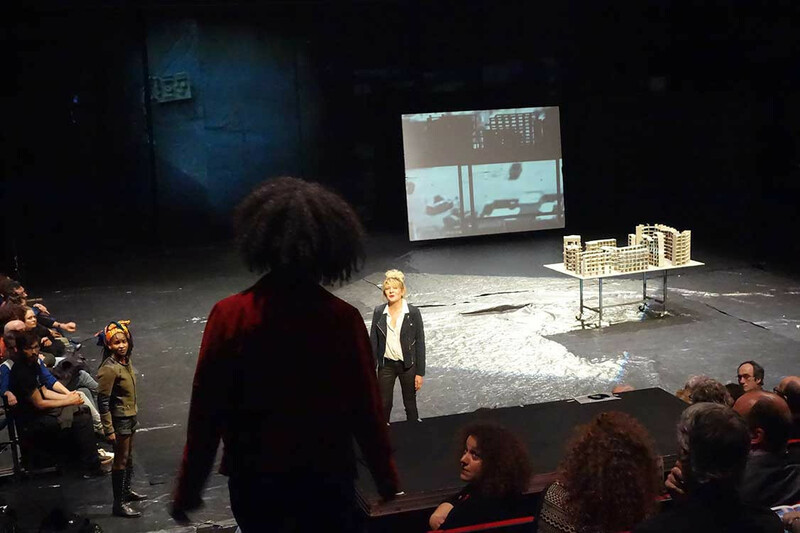 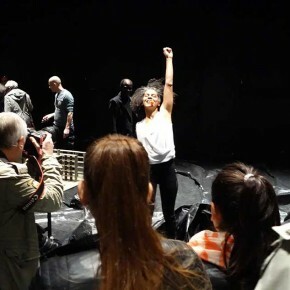 ‘The Penthesilee project’ articulates on stage multiple contemporary figures of women fighting – including particularly Ulrike Meinhof, Fadwa Suleiman… and the complexity of such radical and revolutionary positions, in articulation with desire, love, violence, power in the world in which we live in. 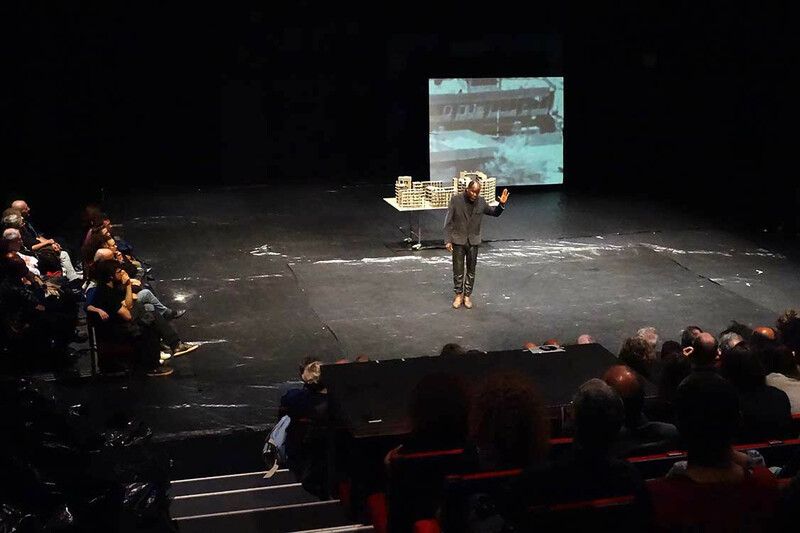 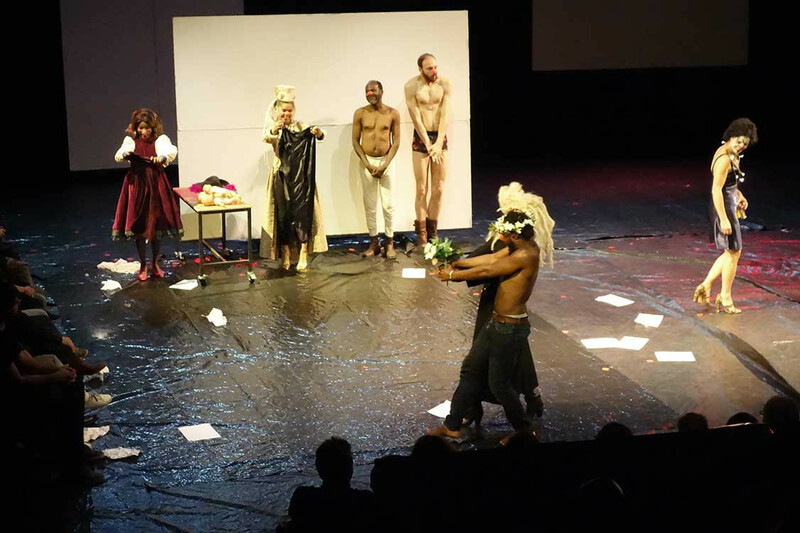 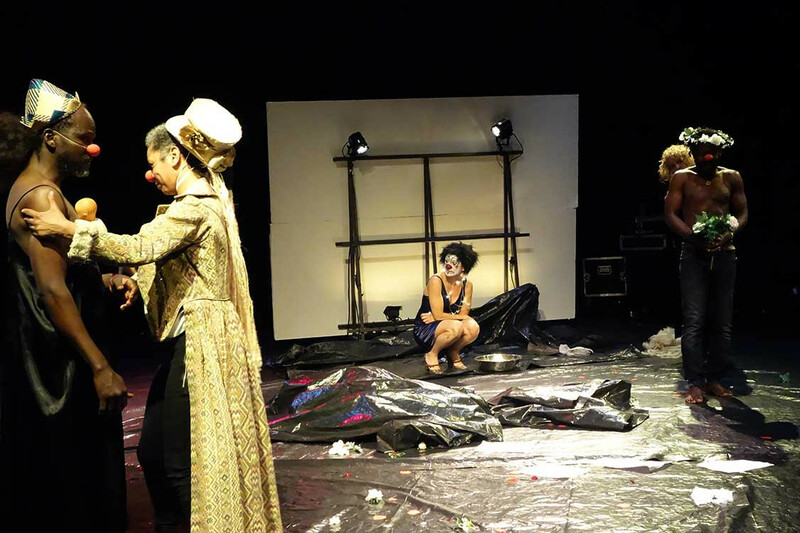 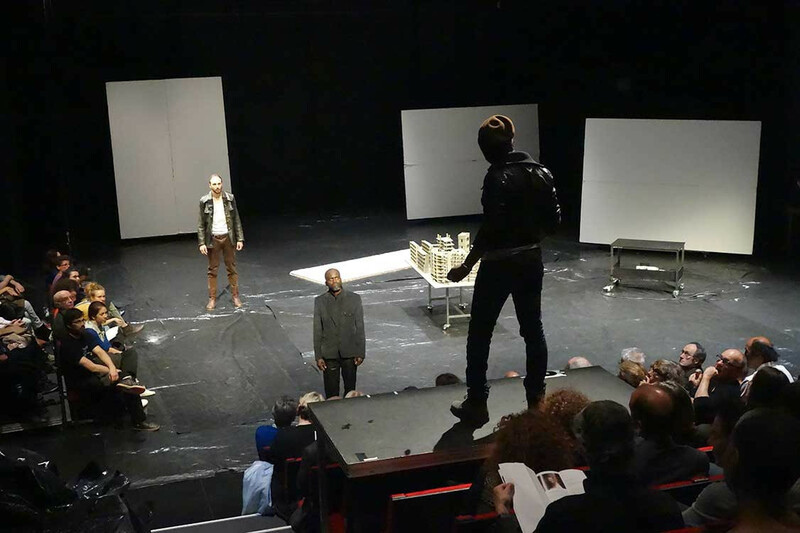 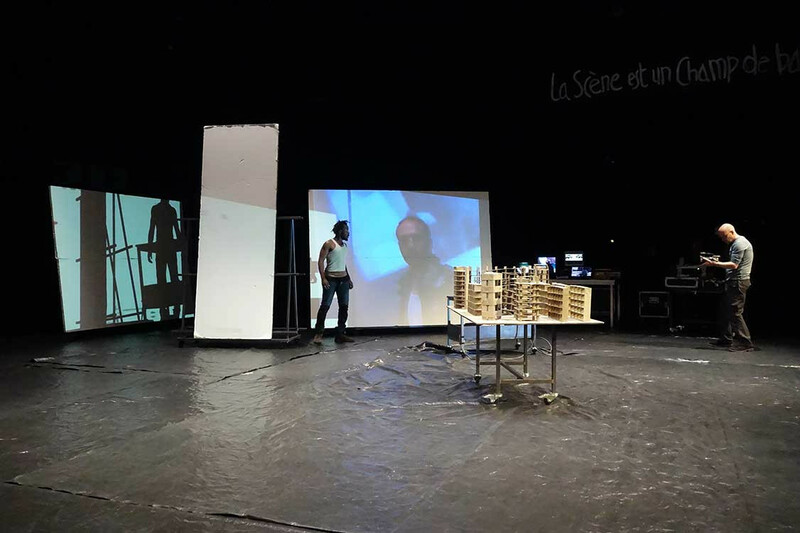 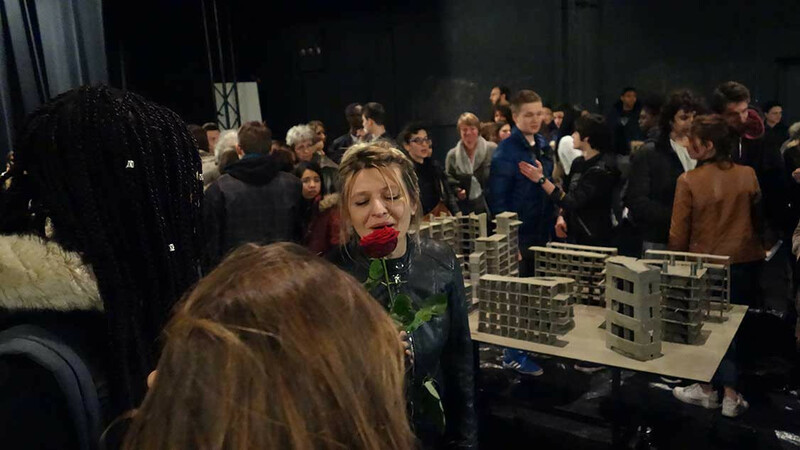 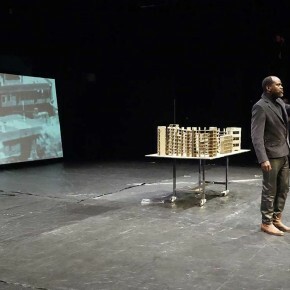 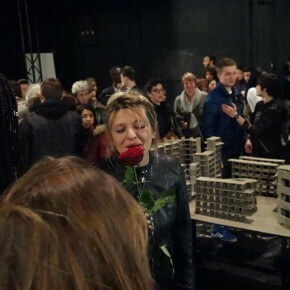 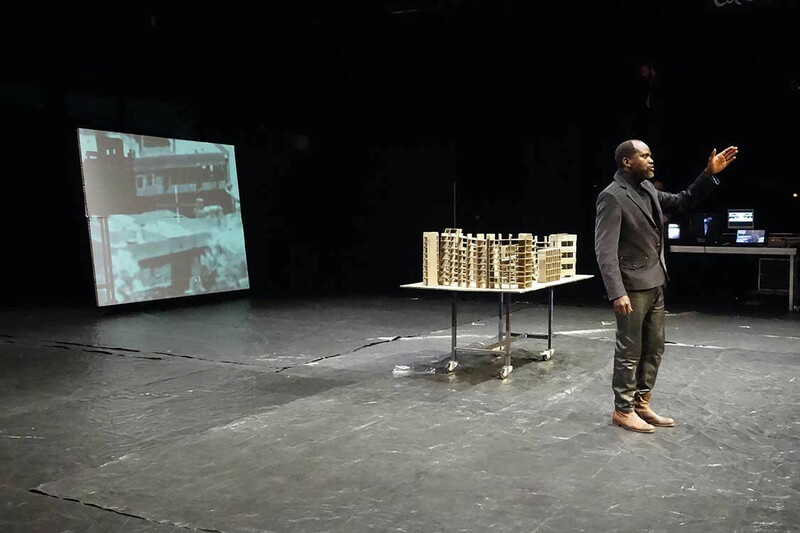 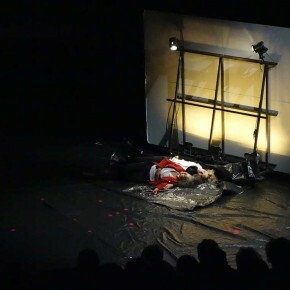 The performance is a the same time a theatrical representation of the Kleist play (translation by Julien Gracq), and the presence of such figures, their words, the political and intimate dimension of their engagement. 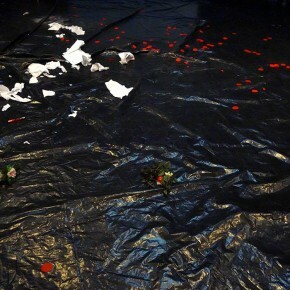 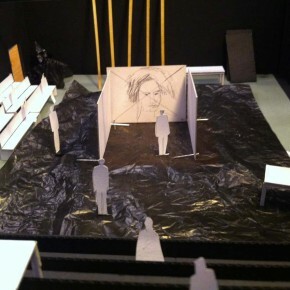 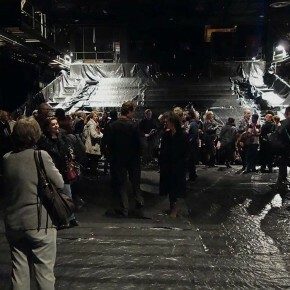 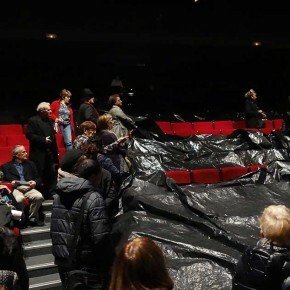 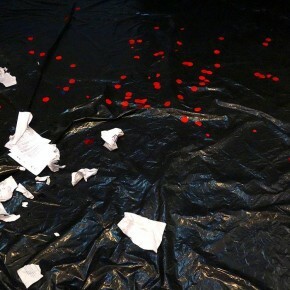 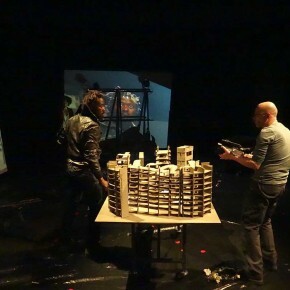 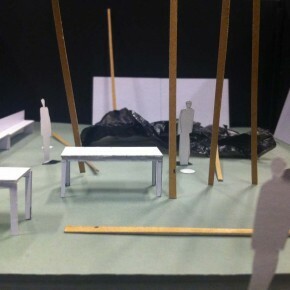 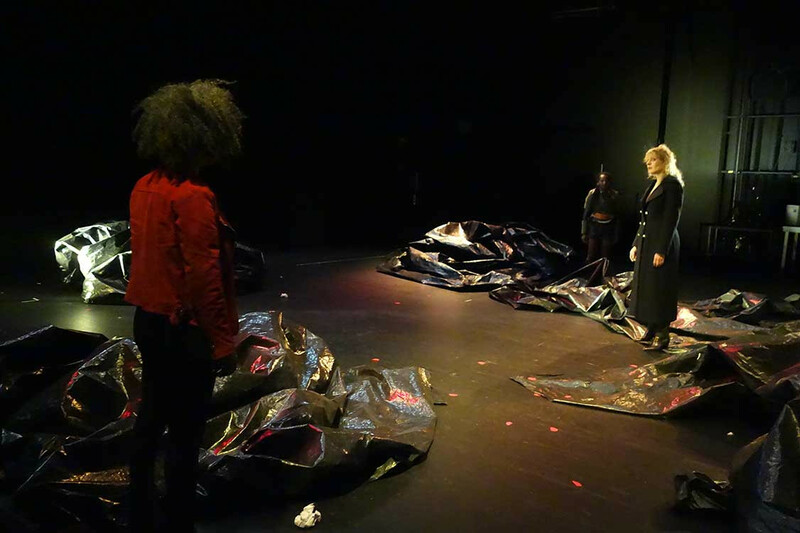 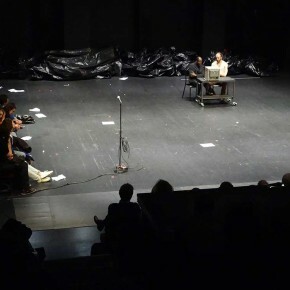 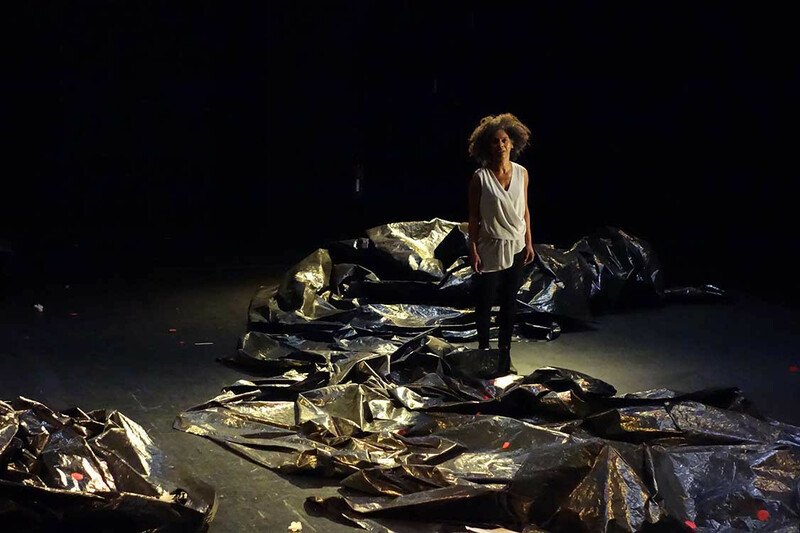 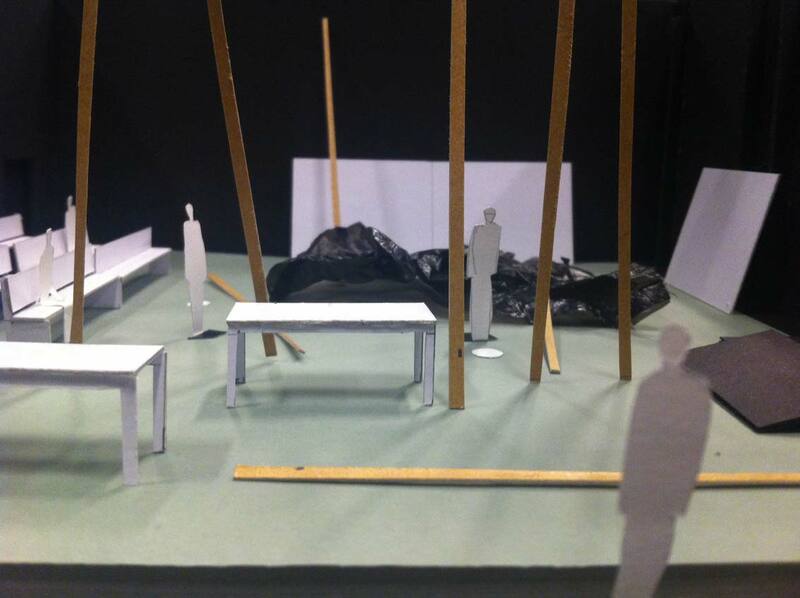 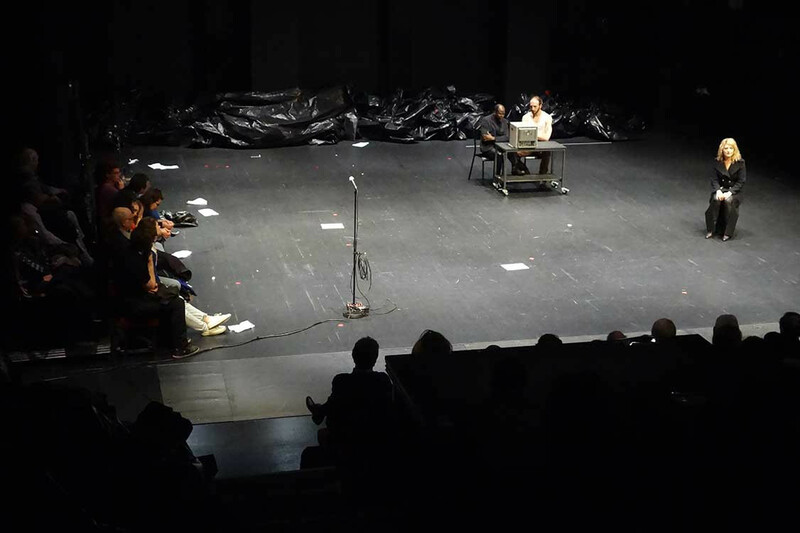 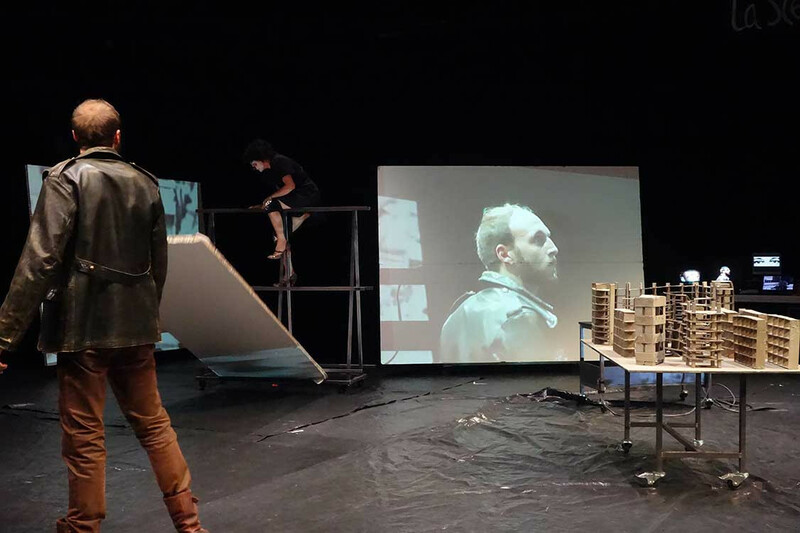 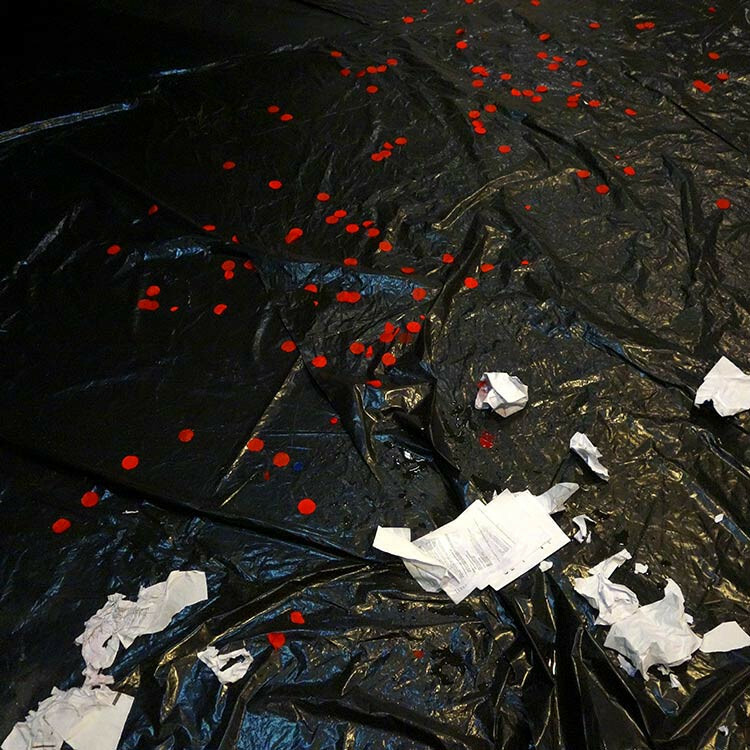 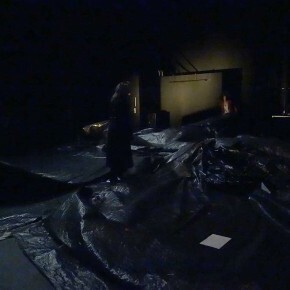 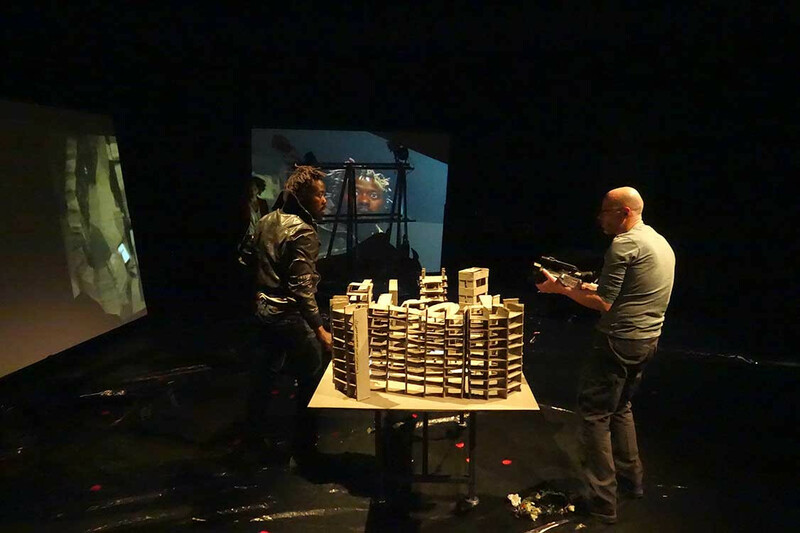 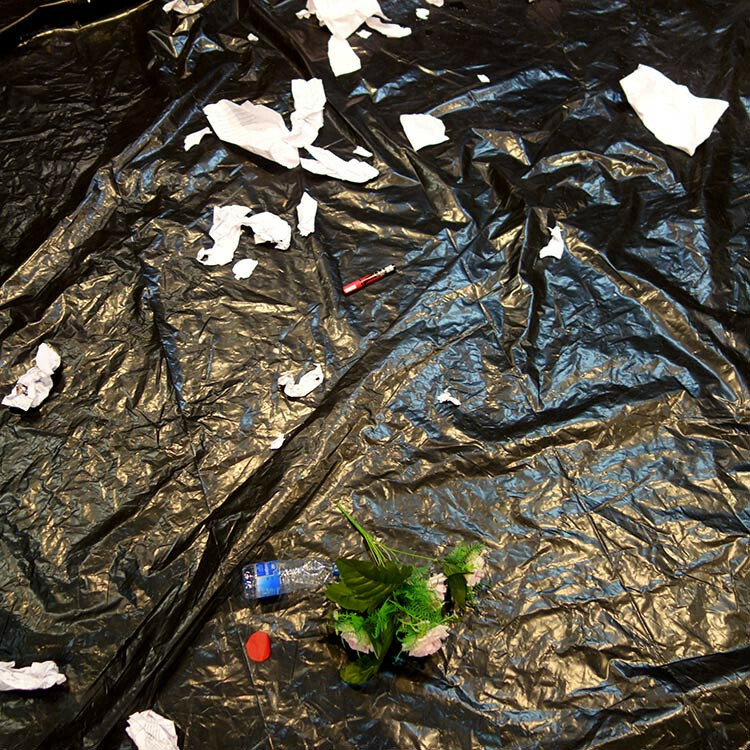 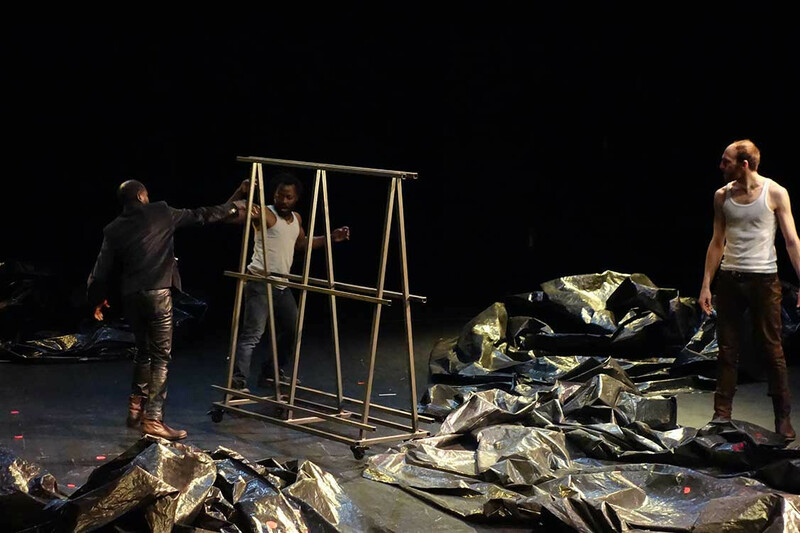 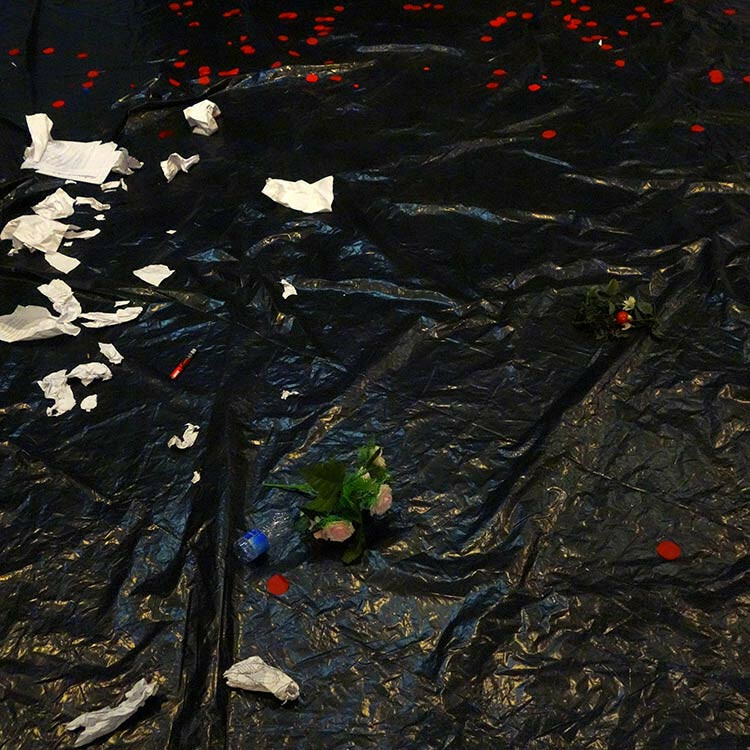 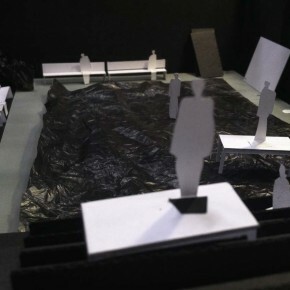 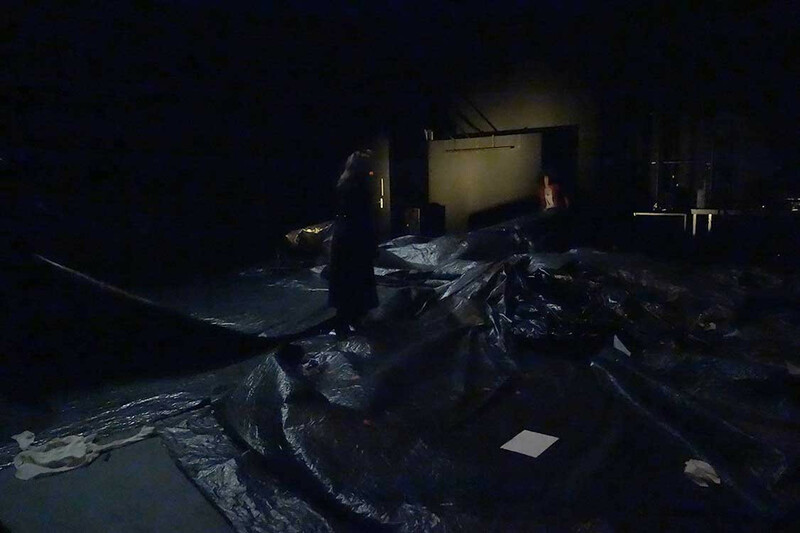 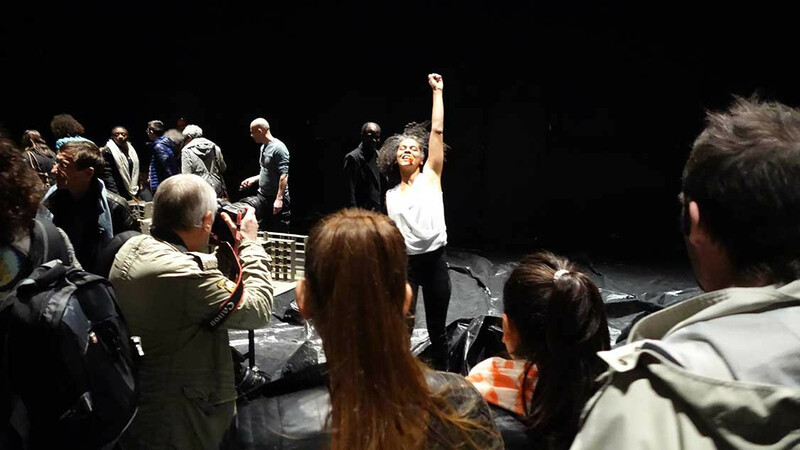 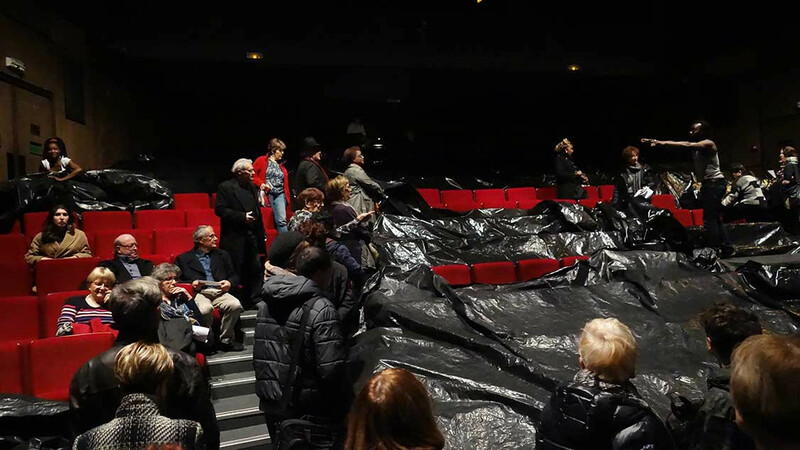 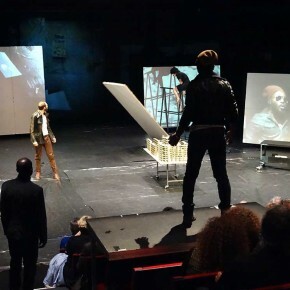 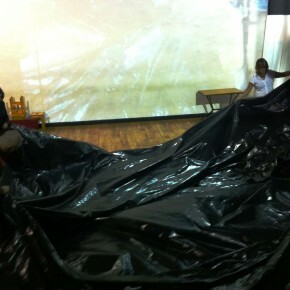 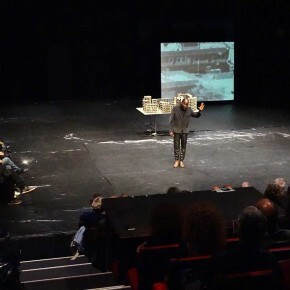 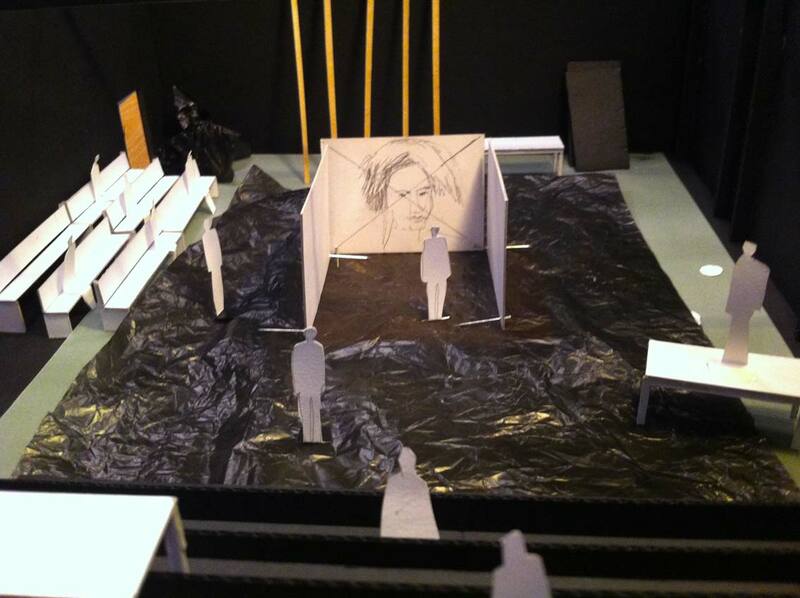 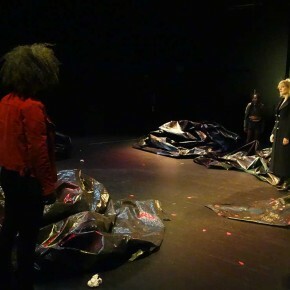 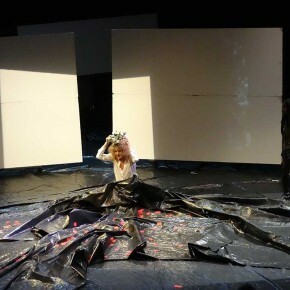 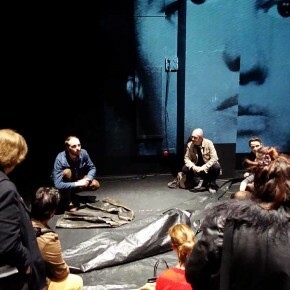 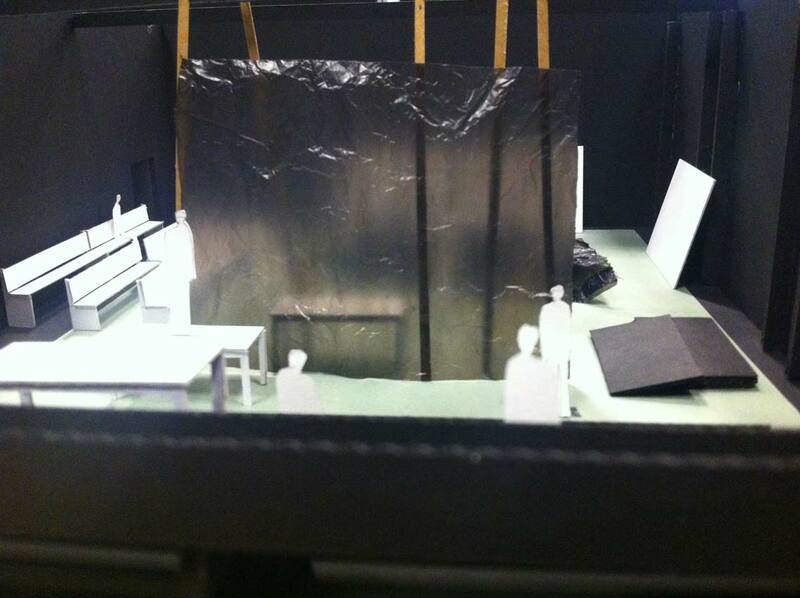 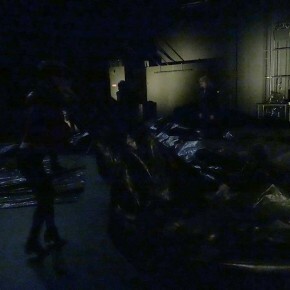 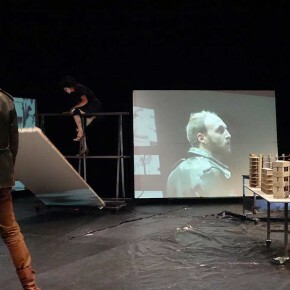 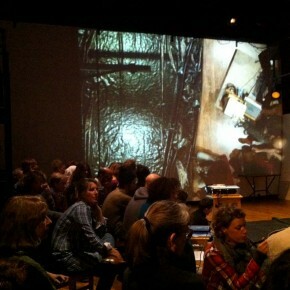 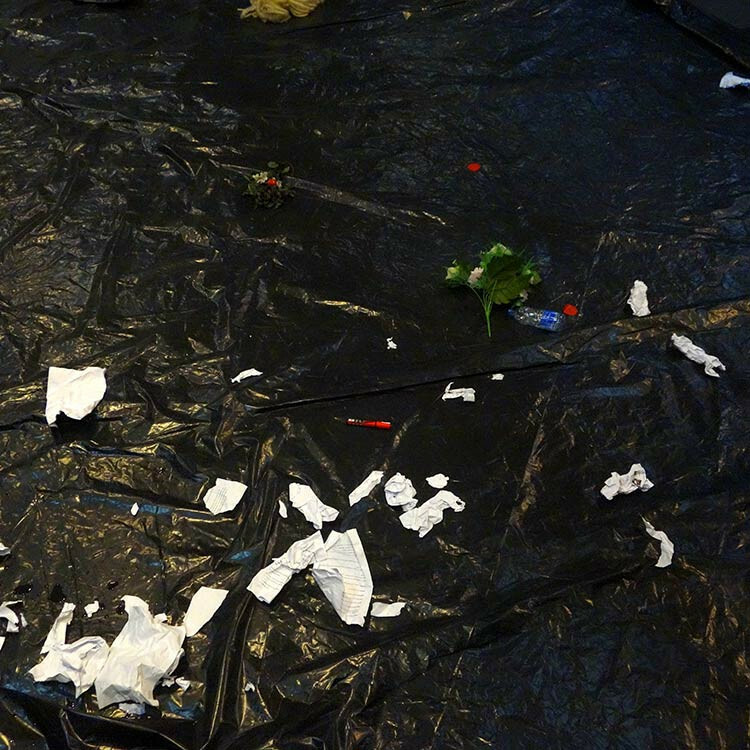 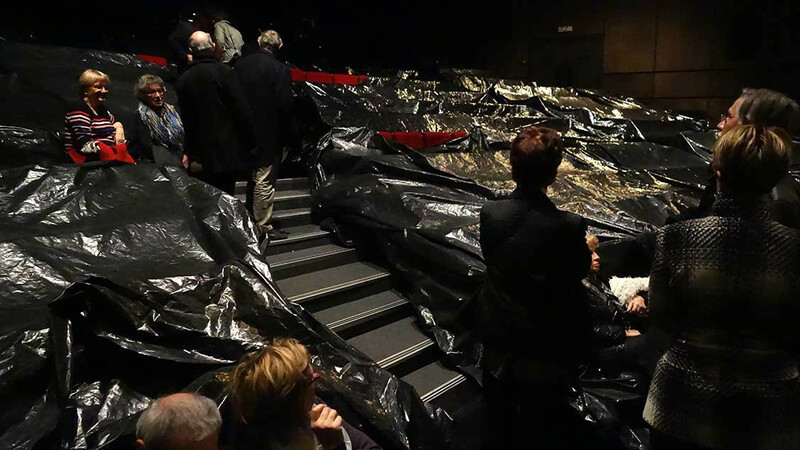 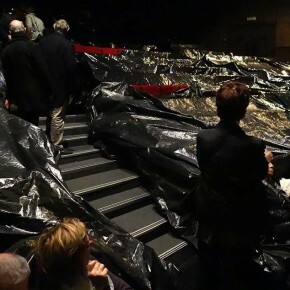 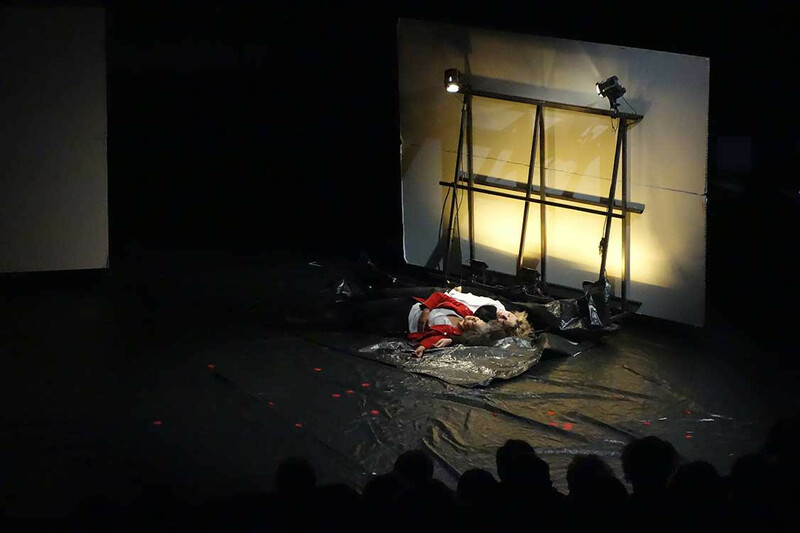 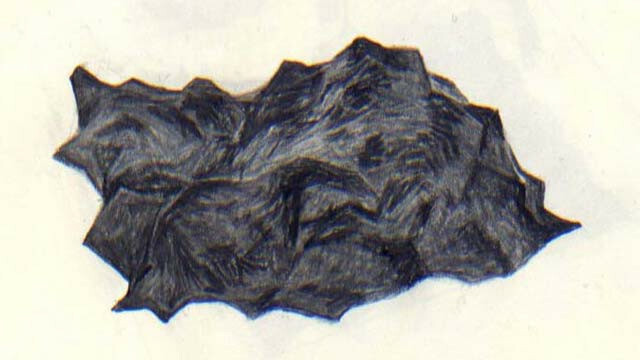 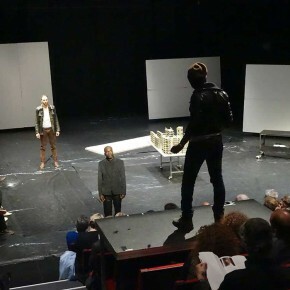 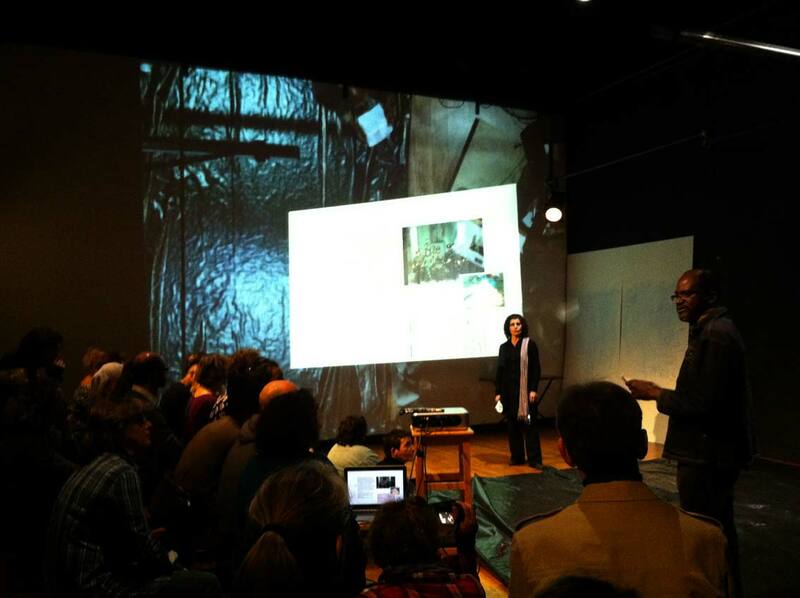 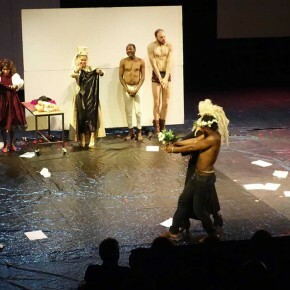 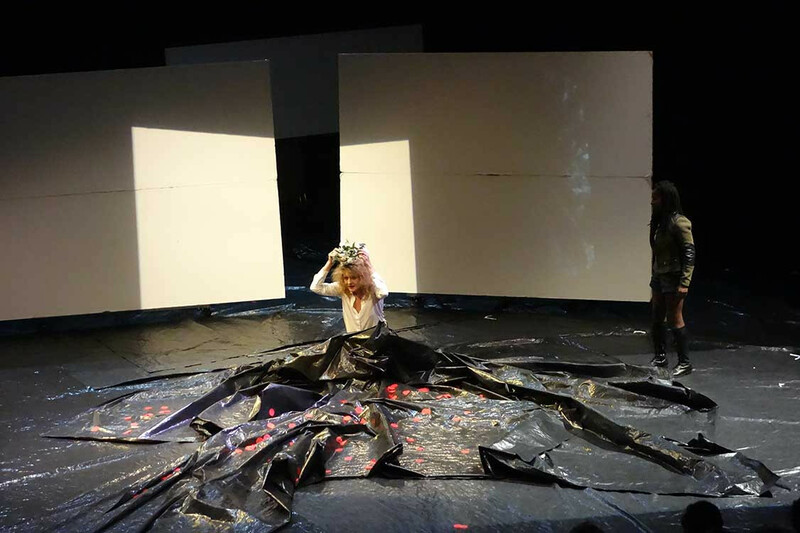 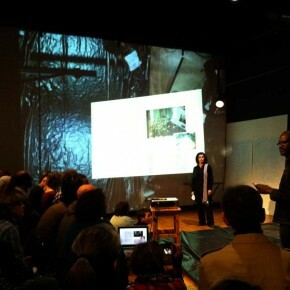 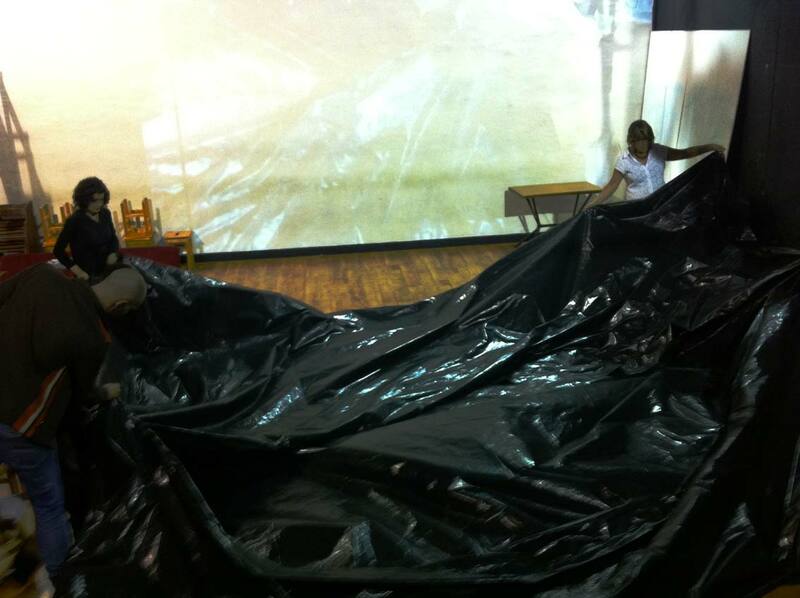 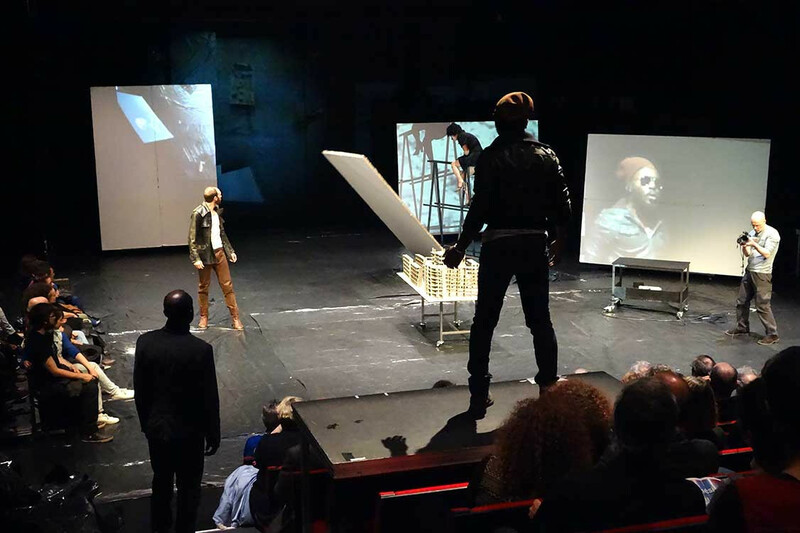 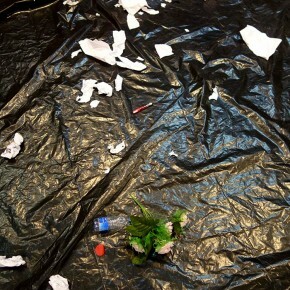 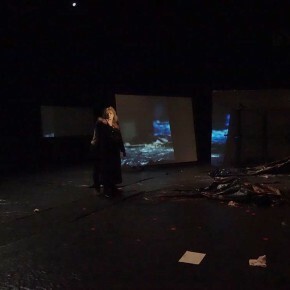 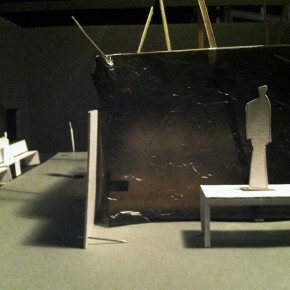 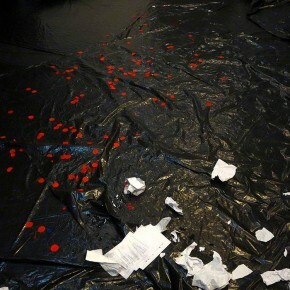 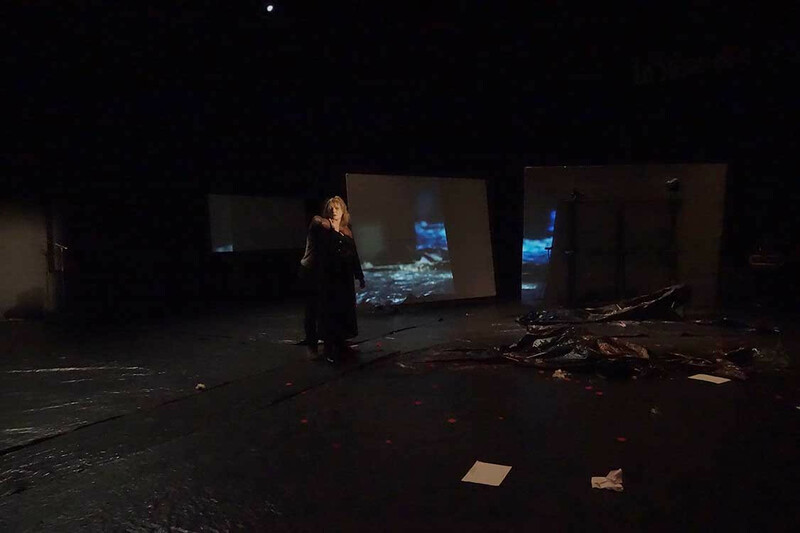 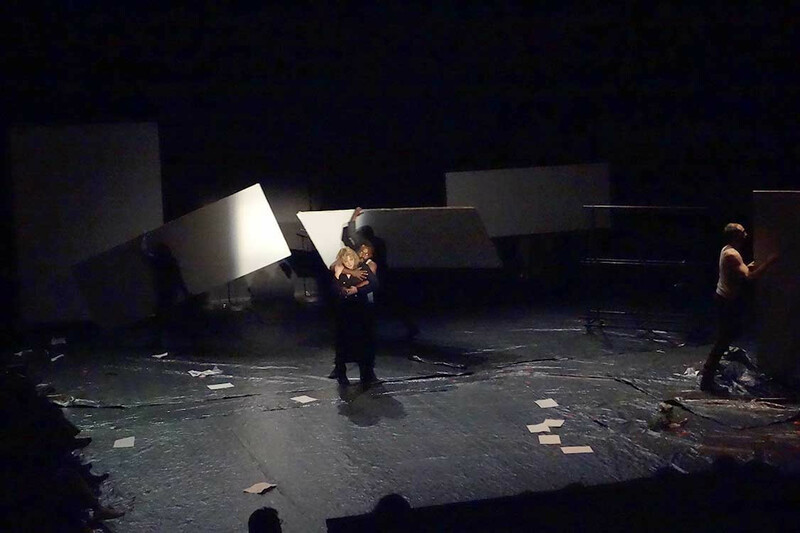 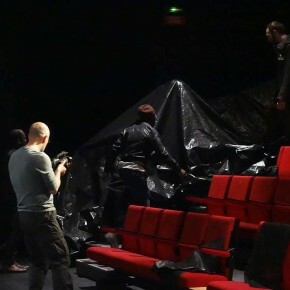 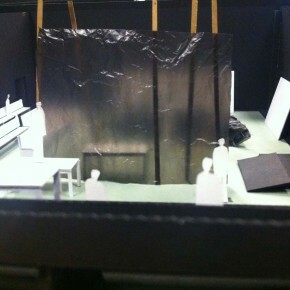 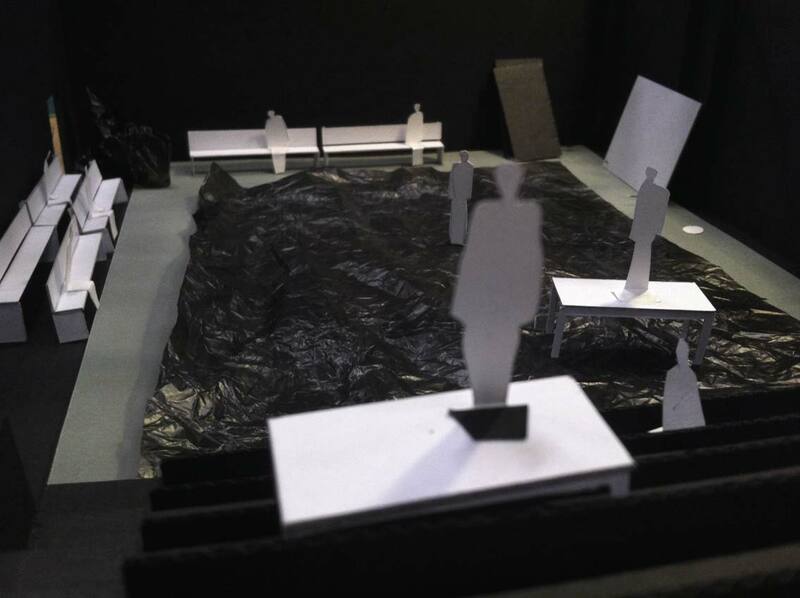 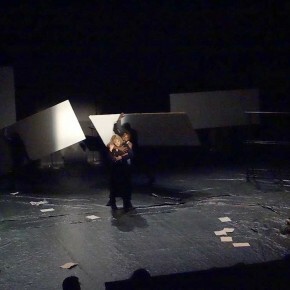 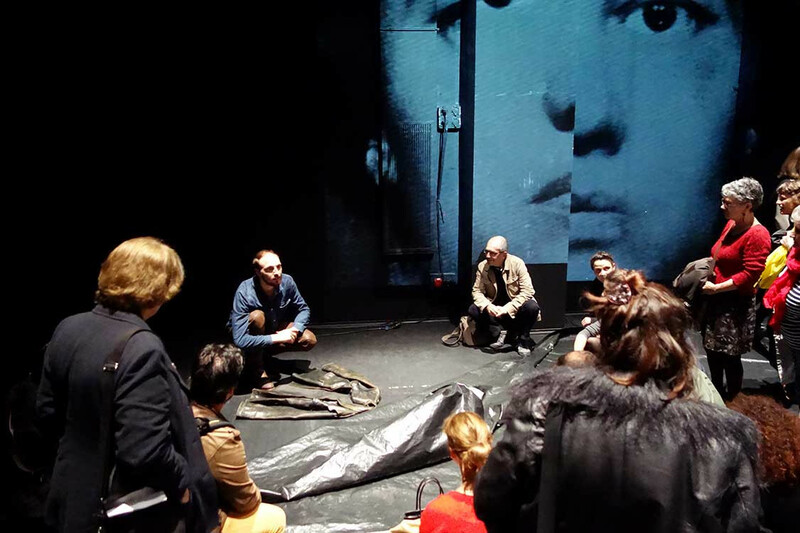 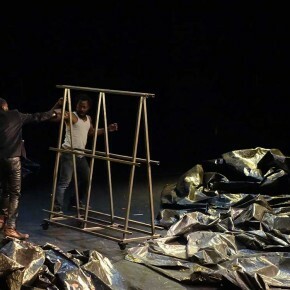 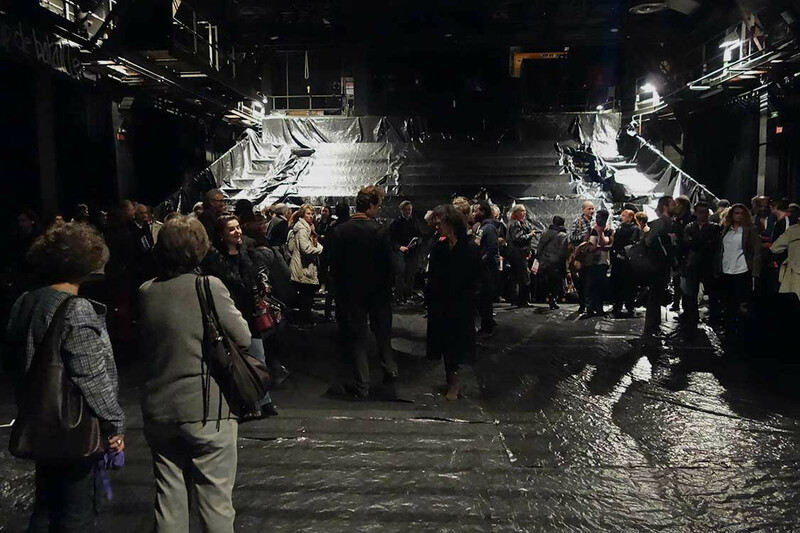 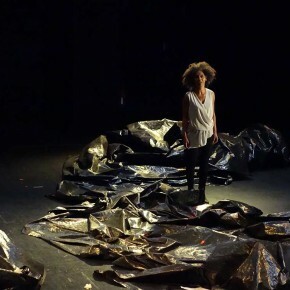 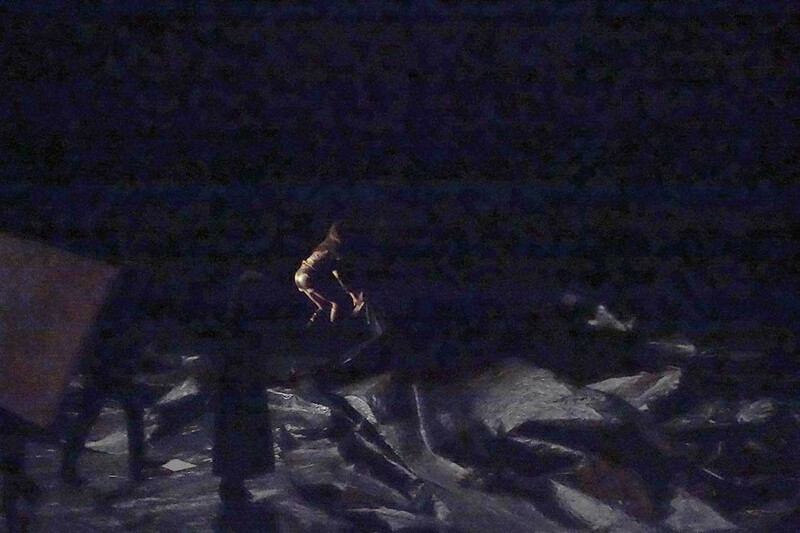 ‘The stage is a battlefield’ says Kleist (first stage direction): from that we develop the scenographic concept around a large black plastic sheet: a process of covering and uncovering the all theater, as a way to involve all presences – participants – of the performance, and to unpack the frontal disposition via shifting it into a common field. 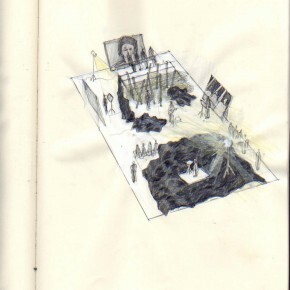 Drawings serie 1 (spring 2014): these drawings result from the first series of experimentations and discussions at the 104 / Paris. 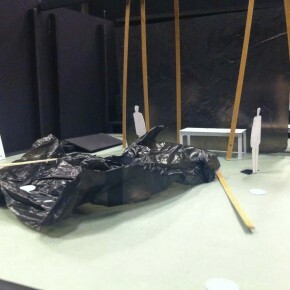 They ‘guided’ the first sessions of work. 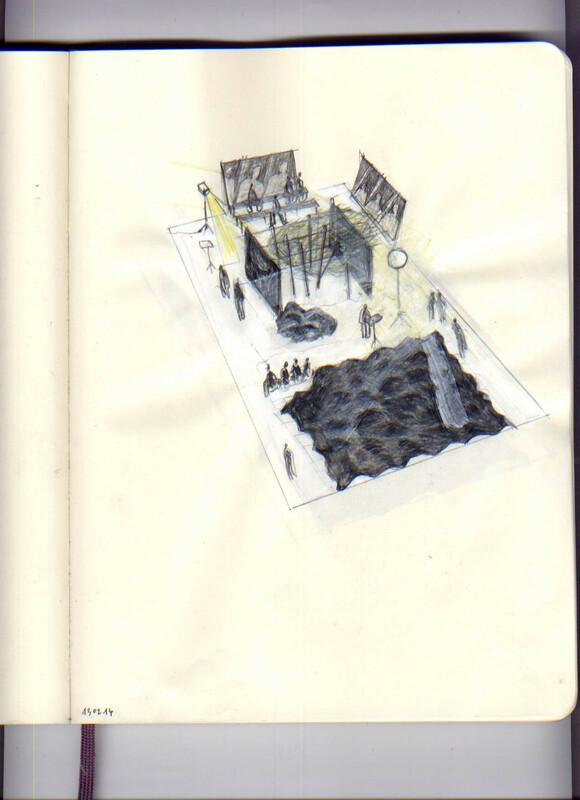 Drawings serie 2 (autumn 2014): the project evolves. 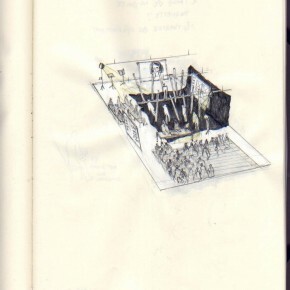 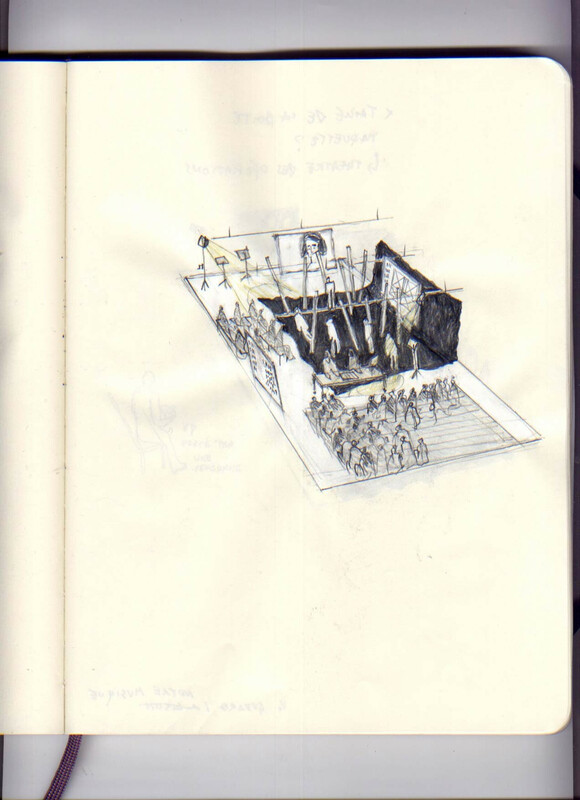 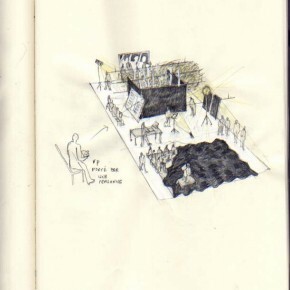 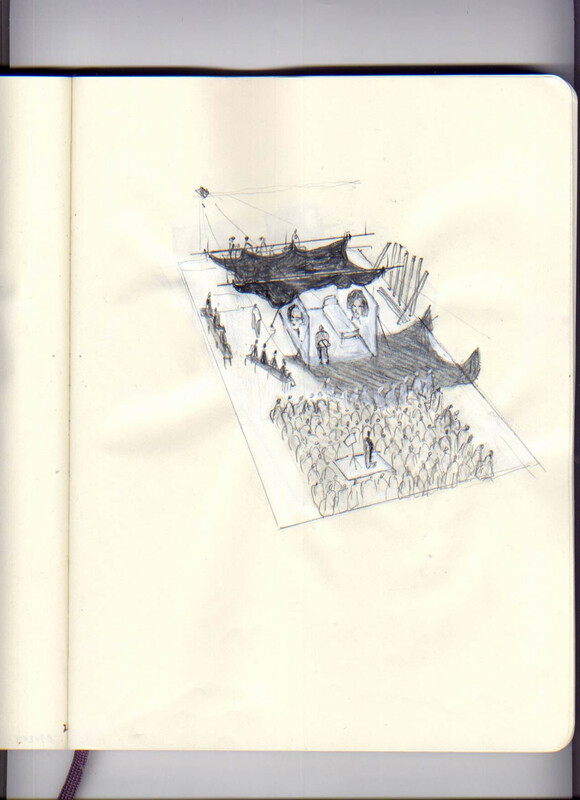 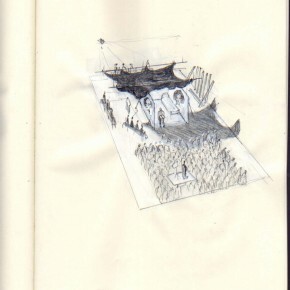 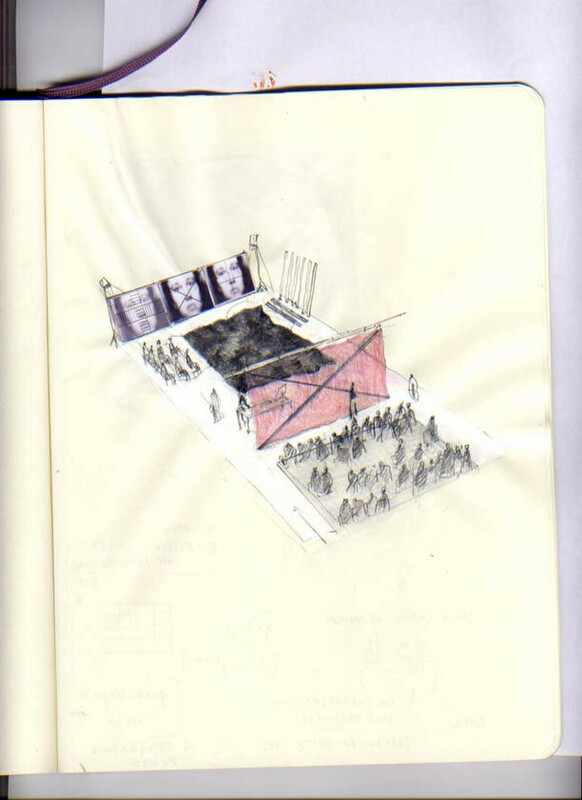 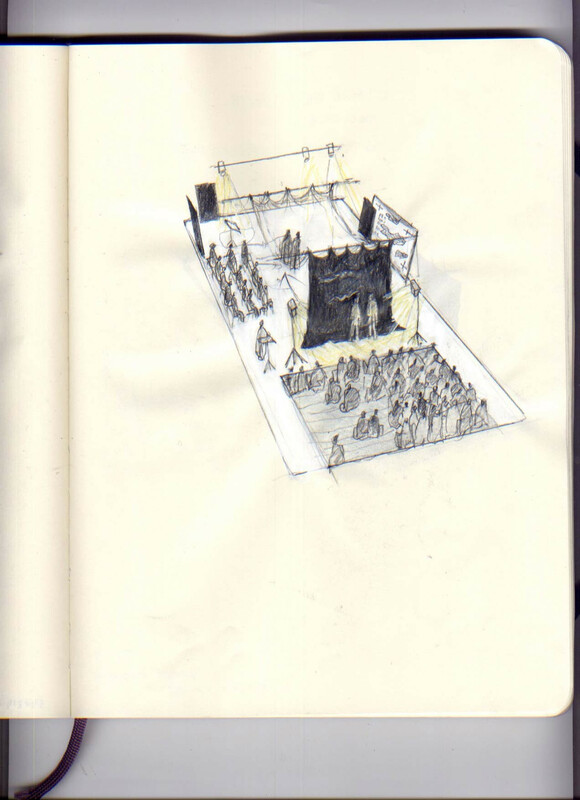 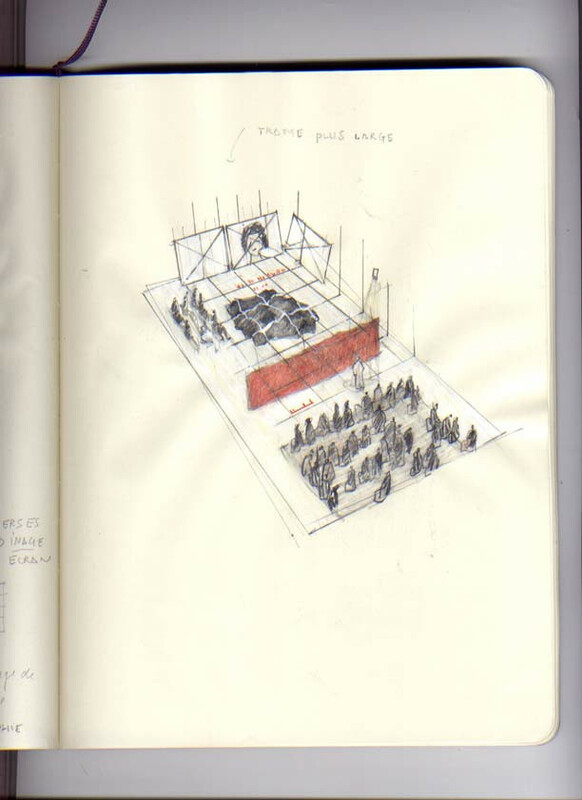 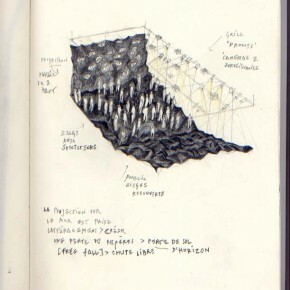 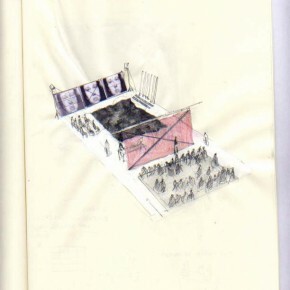 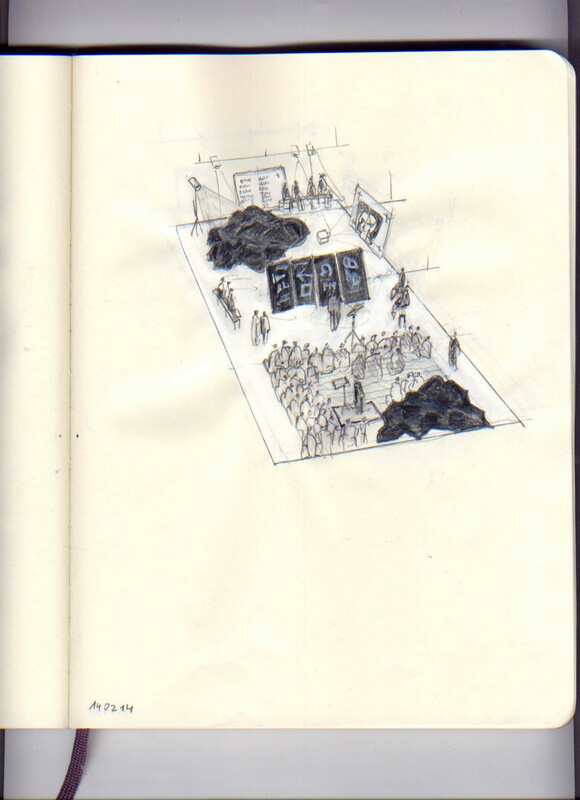 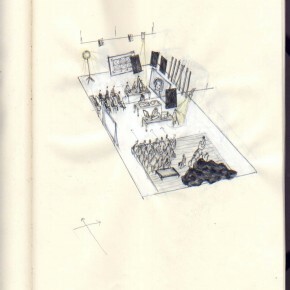 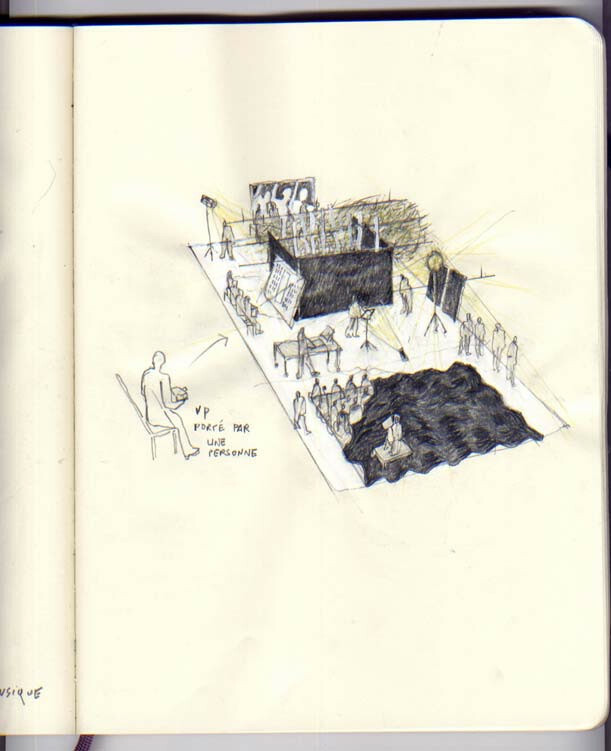 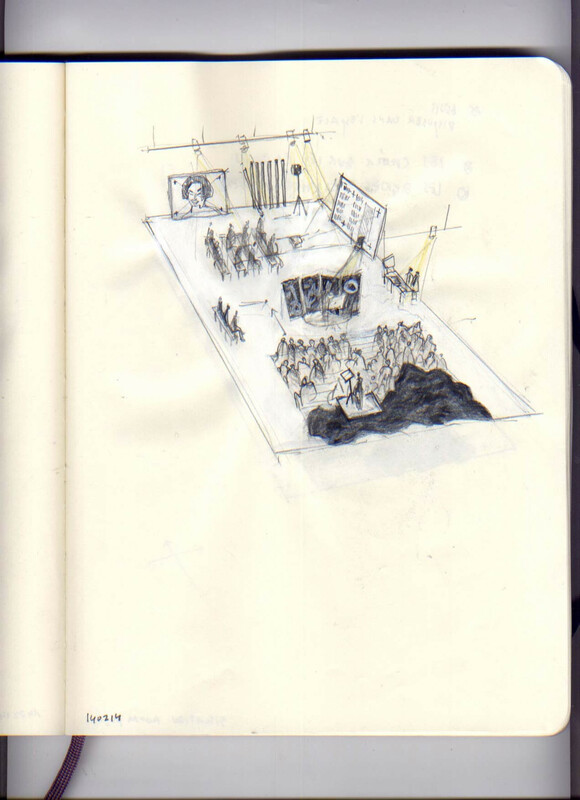 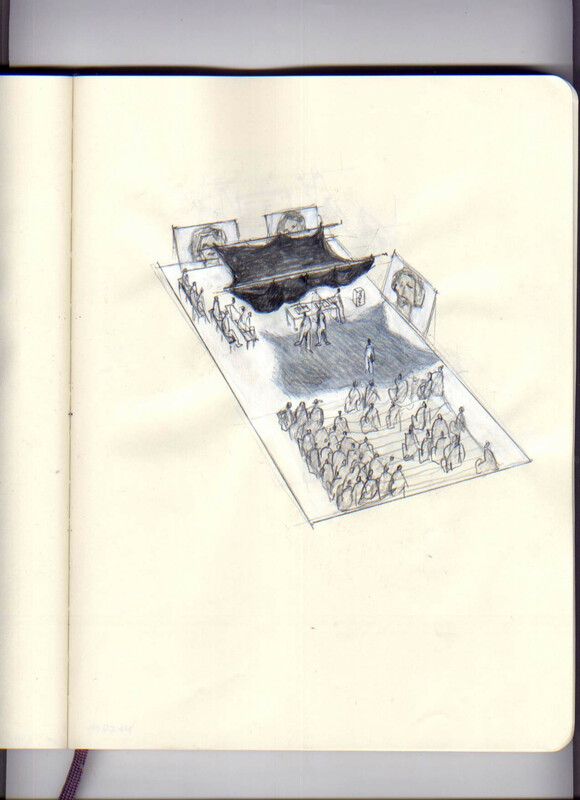 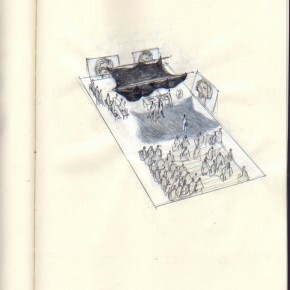 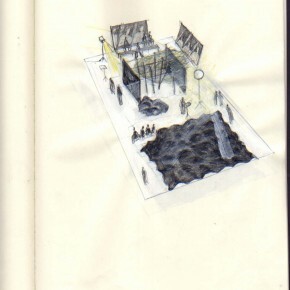 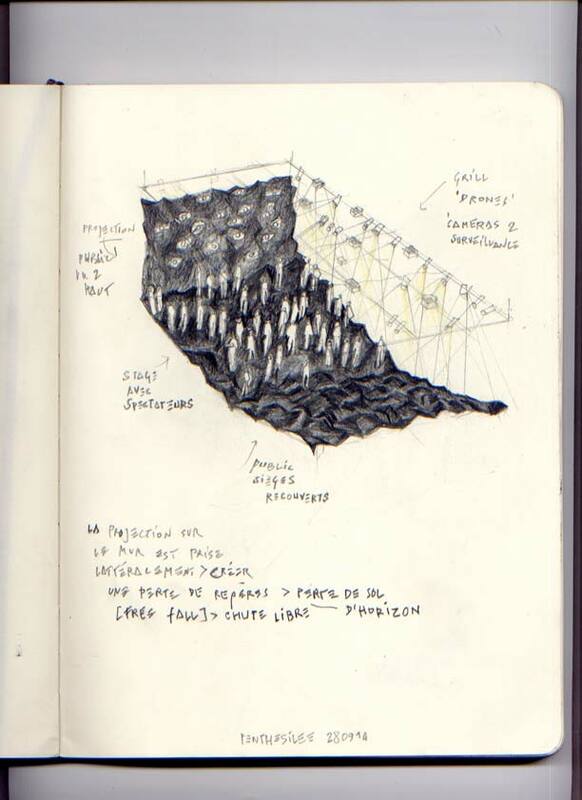 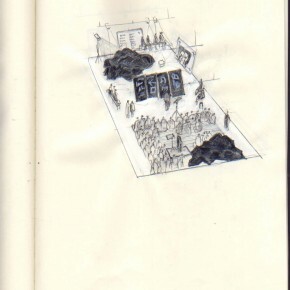 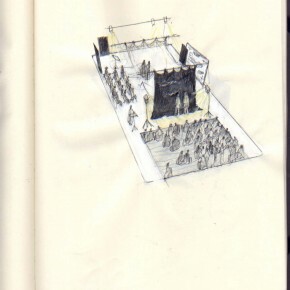 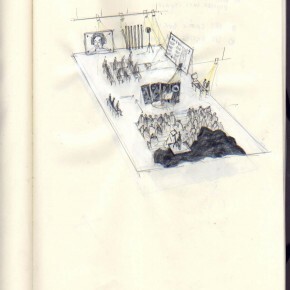 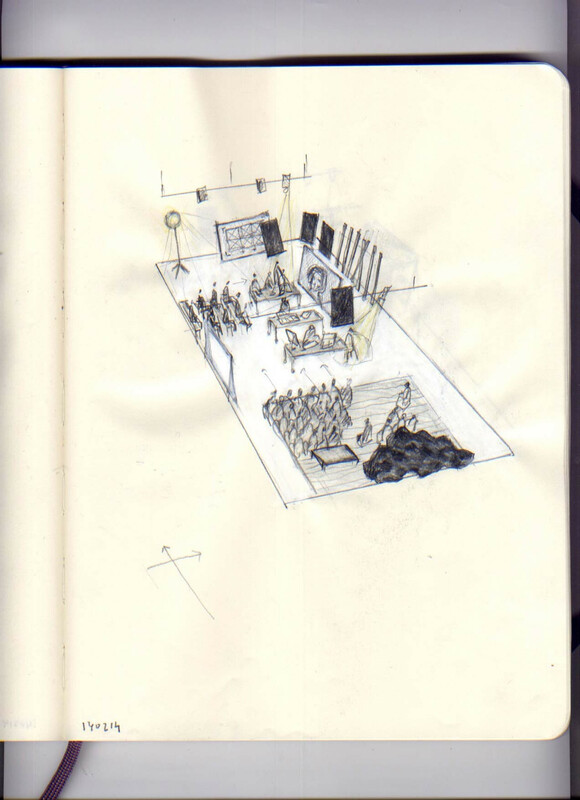 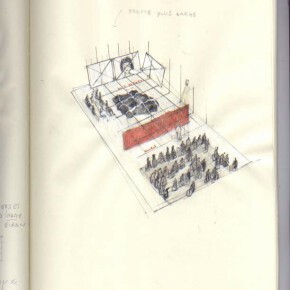 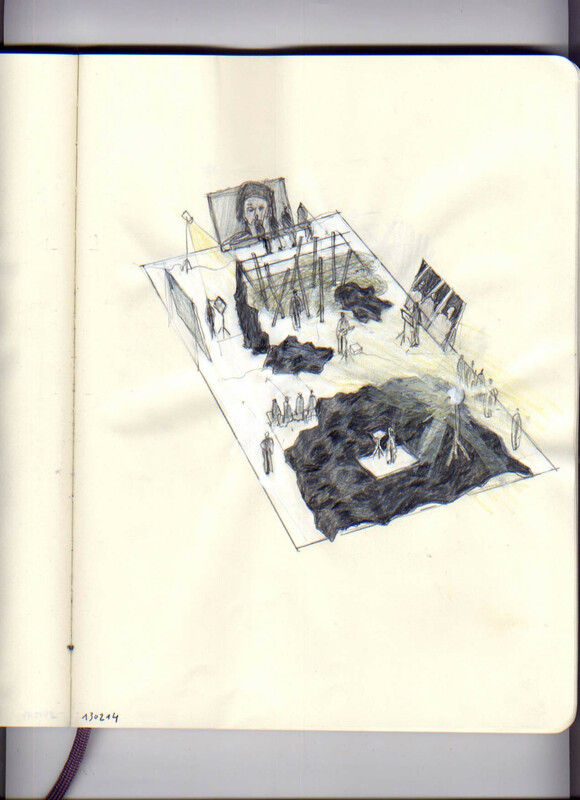 The first drawing describe the principe of the first minutes of the performance, when the audience enters. 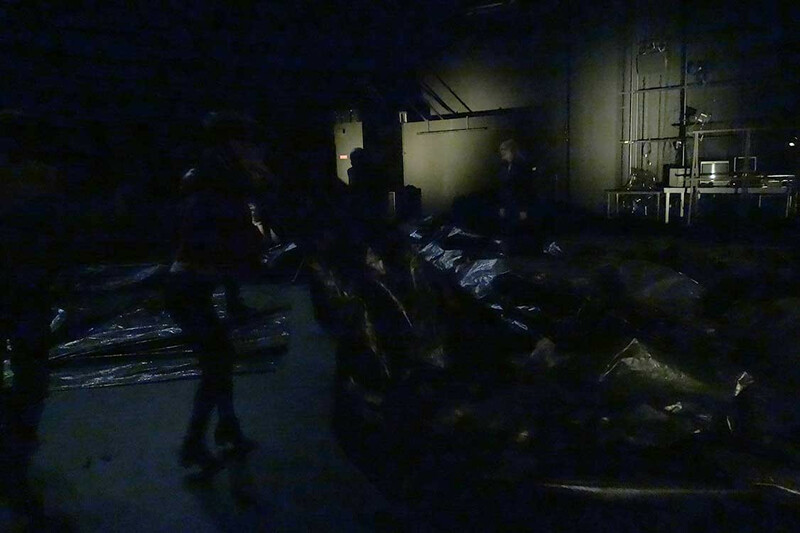 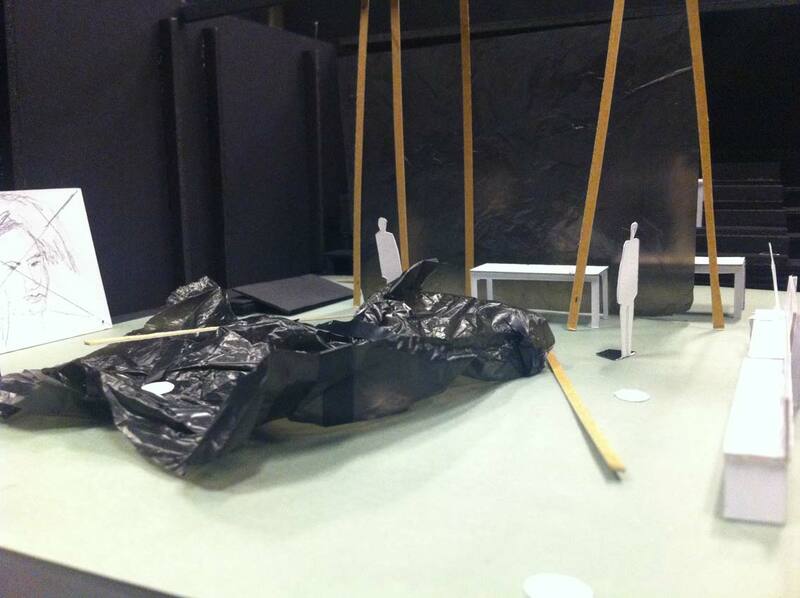 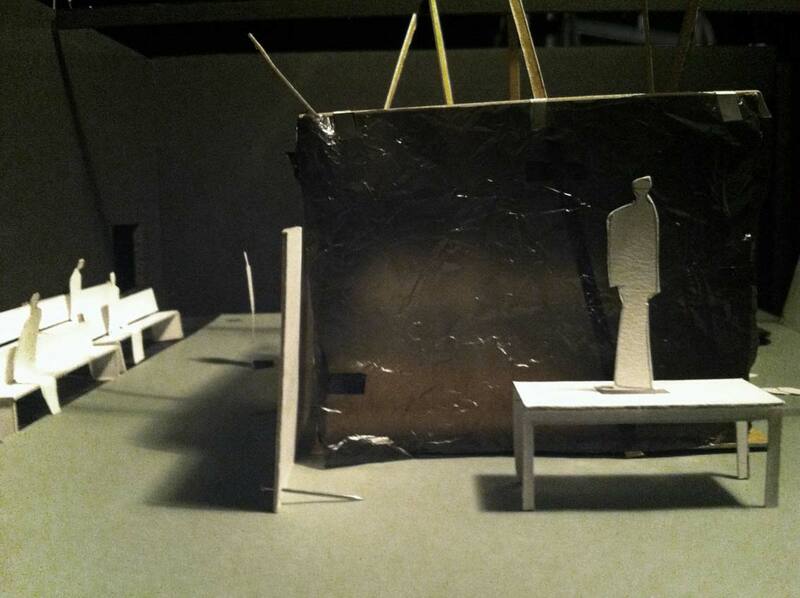 The all space is covered with a black plastic, like a burned battlefield. 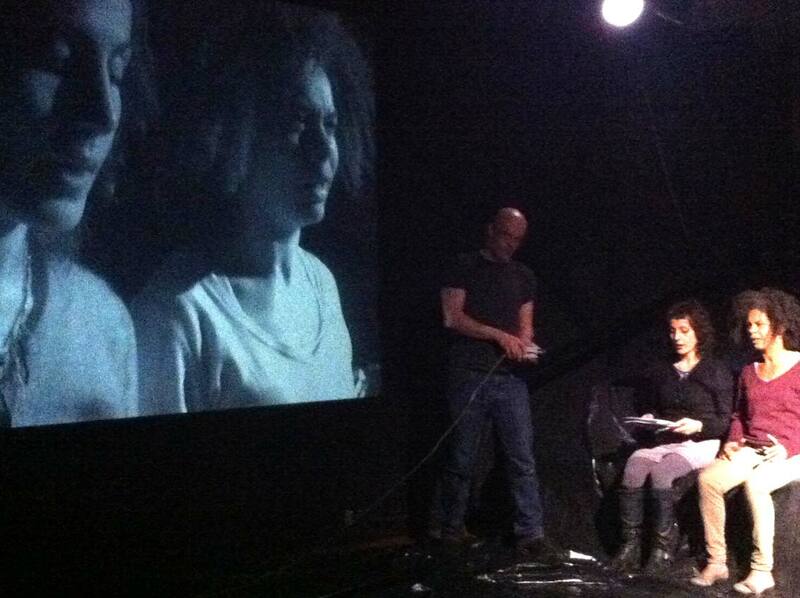 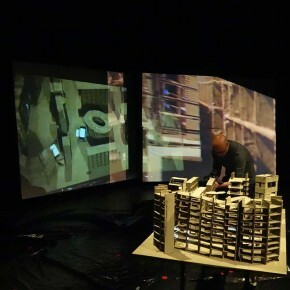 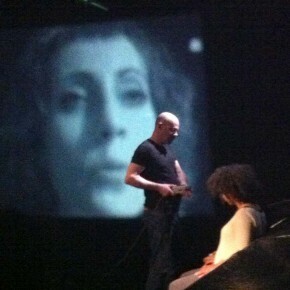 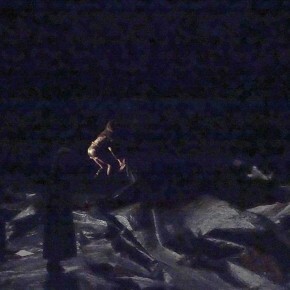 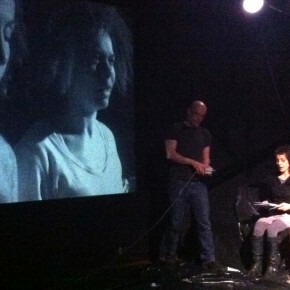 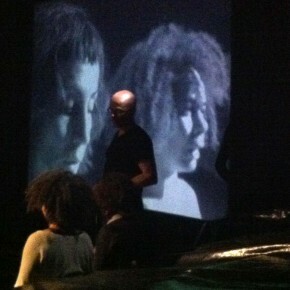 A ‘drone’ films, and is projected on the back wall. 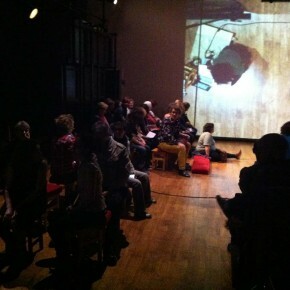 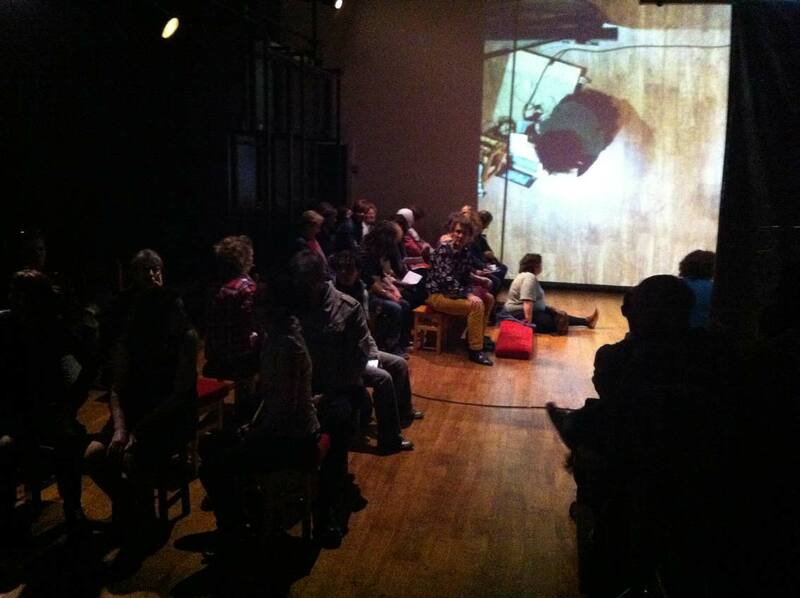 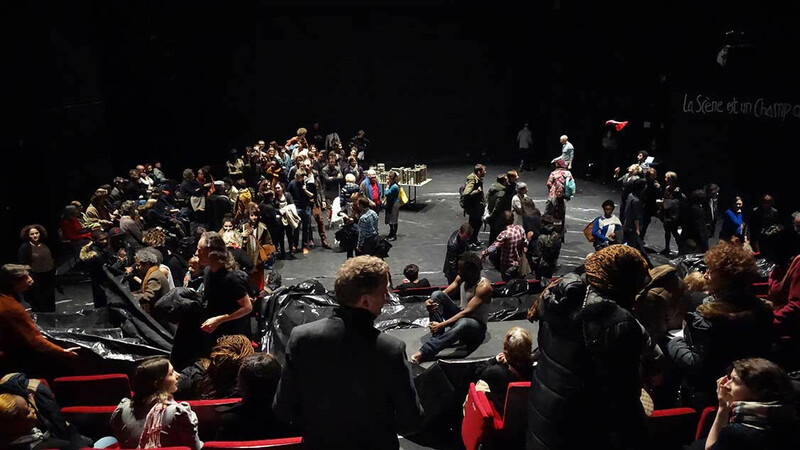 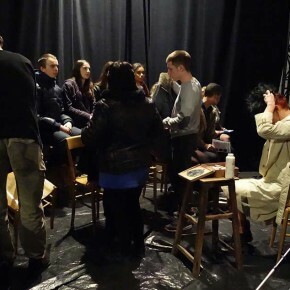 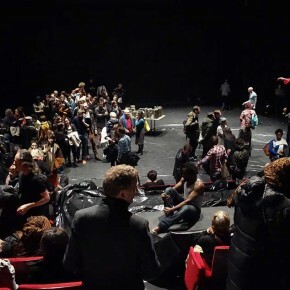 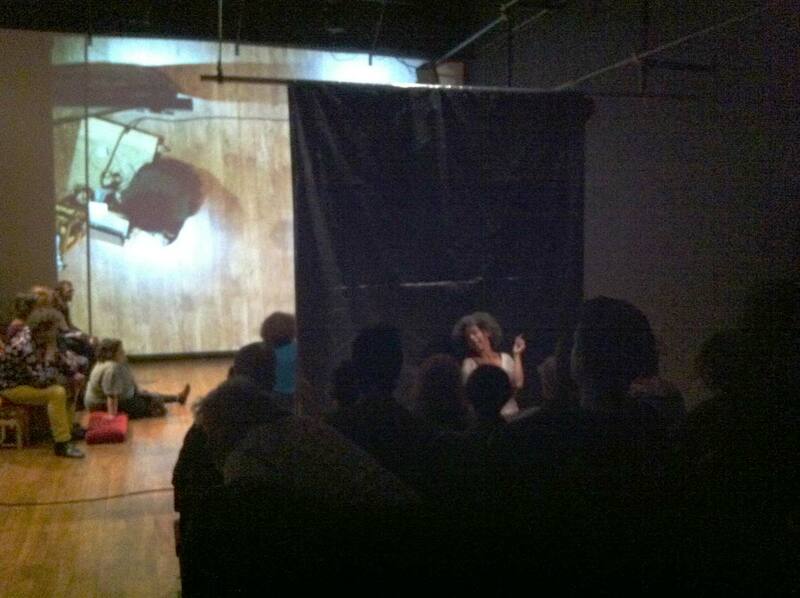 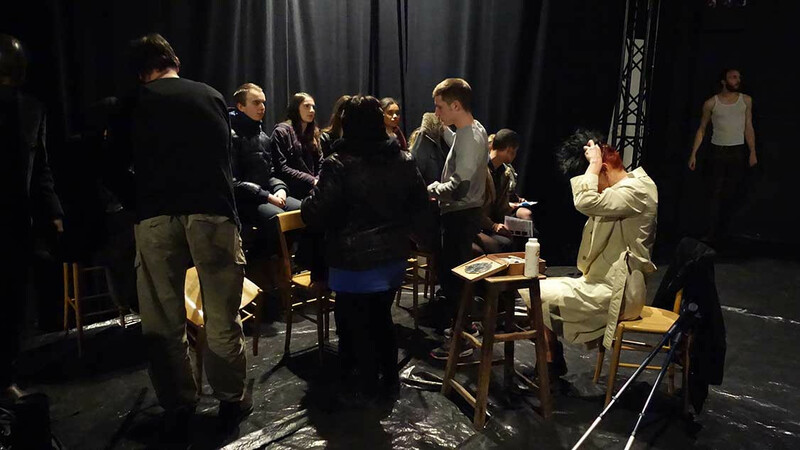 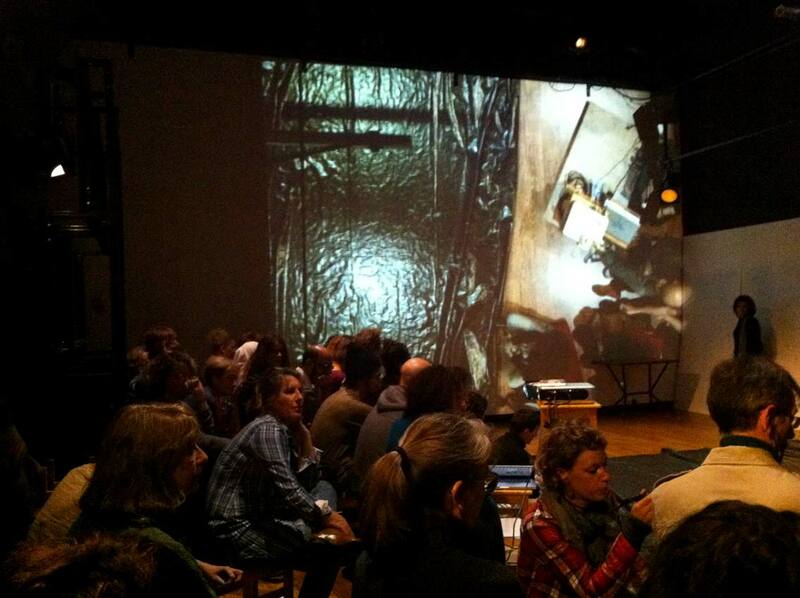 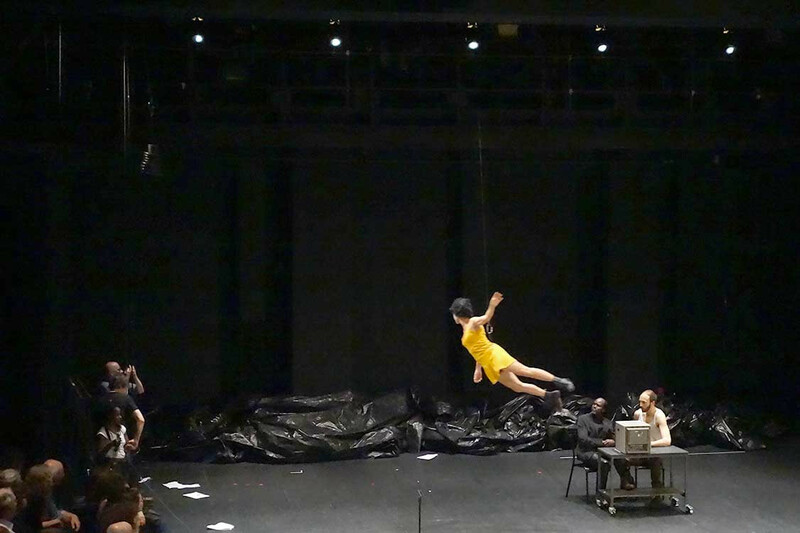 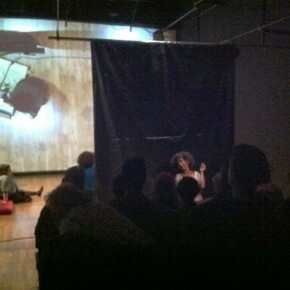 After a few minutes, the audience and the performers unpack the space, and sit. 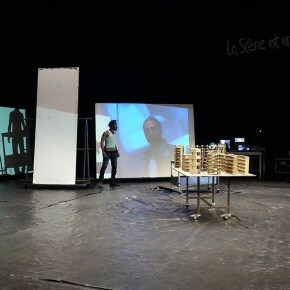 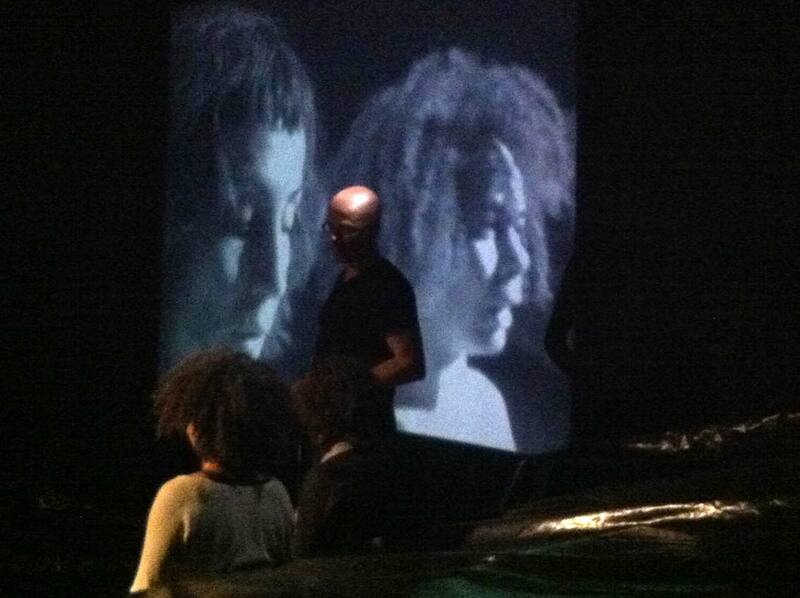 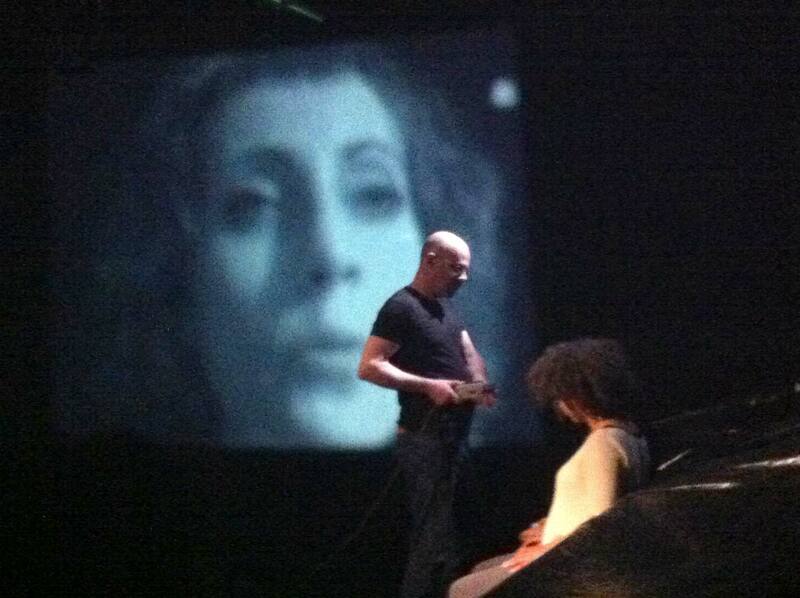 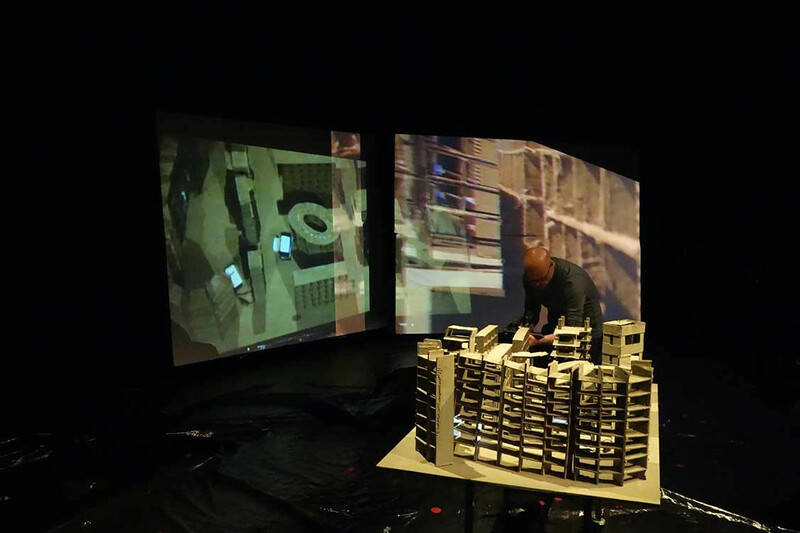 First series of experimentations in 2014: Théâtre de la Cité – Marseille, april 2014 & 104 – Paris, feb and may 2014. 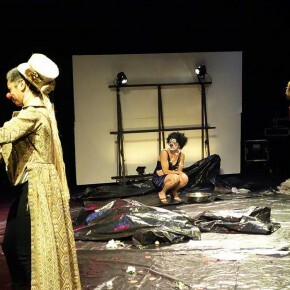 With Fadwa Suleiman, Nanthéné Traoré, Leyla Rabih, Marcel Mankita, Laurent Vergnaud.